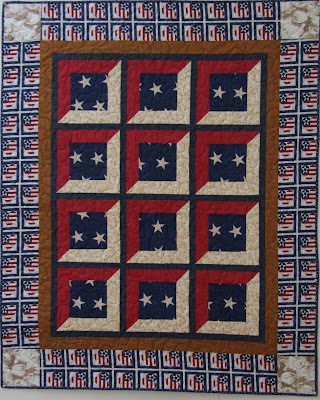 Today we're showing one of our favorite red, white and blue quilts. 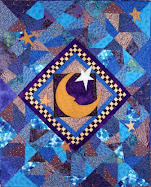 Judy Laquidara designed and made the "Celebration of Freedom" quilt in 2005. The quilt became the focal point of an auction by The Defense Credit Union Council, with the proceeds going towards the Pentagon Memorial Fund. The quilt brought $4,595 at auction --- a DCUC record for a single item! 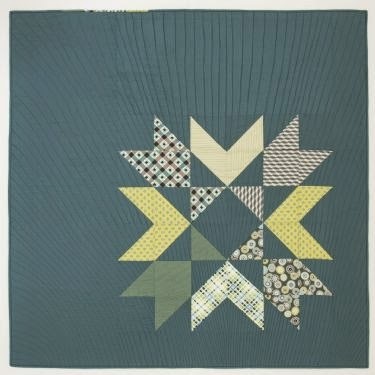 We love the vibrant star design in the center of the quilt, and the fourteen interconnected sawtooth stars. See the detail, below, including the fabulous machine quilting. Isn't it beautiful? 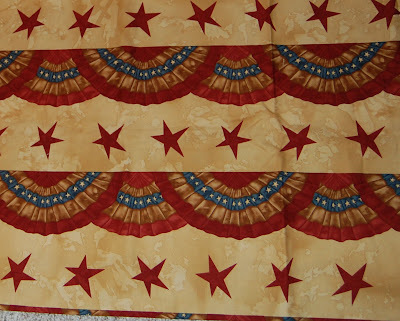 The star centers were fussy cut from the star-and-bunting fabric shown below. 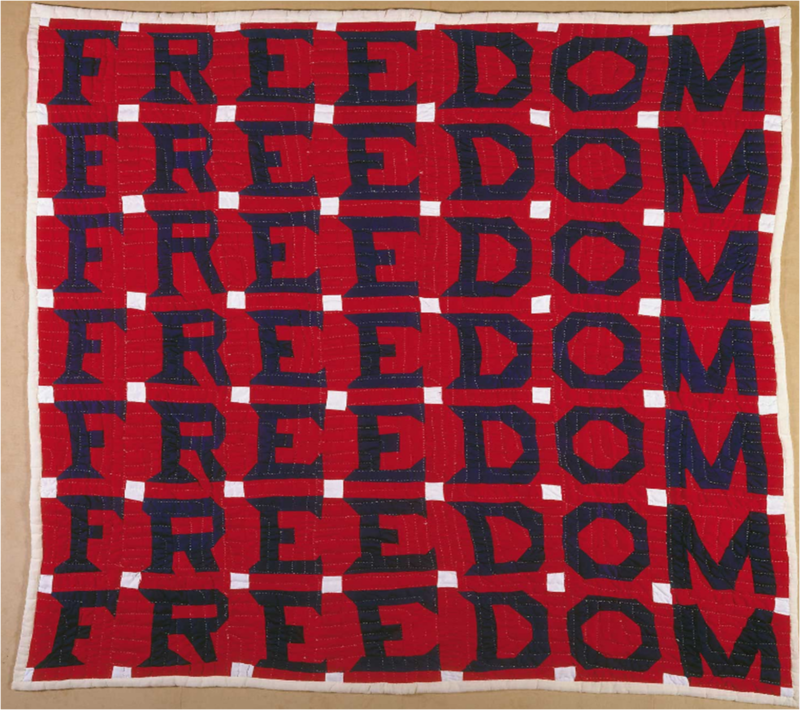 Quilt Inspiration: What was your inspiration for Celebration of Freedom? 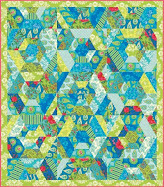 Judy Laquidara: The fabrics were part of the Moda Challenge for 2005 (I think that was the year). 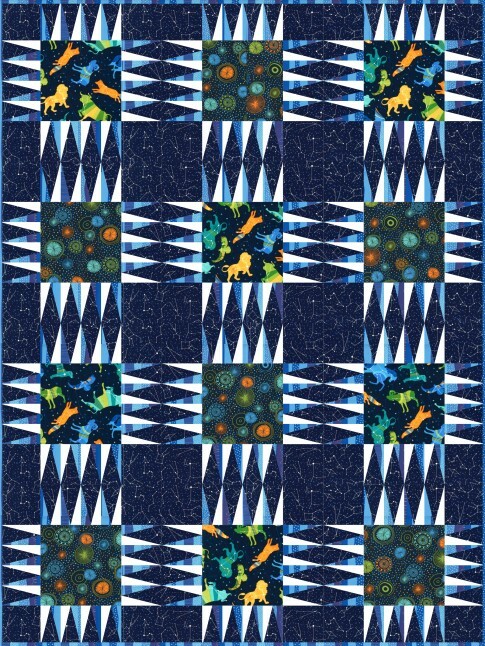 The packet contained 4 or 5 different fat quarters and the challenge was to create an original quilt using those fabrics, plus more of any of those lines. Q.I. : The design is quite distinctive. How did the design come about? 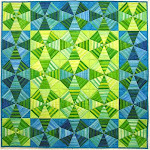 Judy Laquidara: I design using Electric Quilt software. 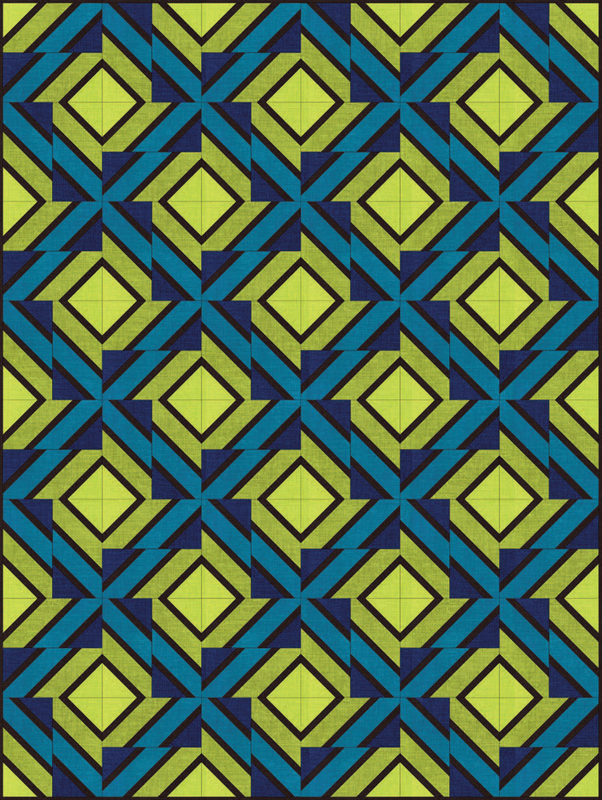 I find it harder to design a quilt with a specific quilt in mind and prefer to design a quilt, then choose the fabric. Actually I cannot remember how that particular design developed. Usually my designs happen just by playing with a block or two, adding sashing, and working those elements until the design pleases me. Q.I. 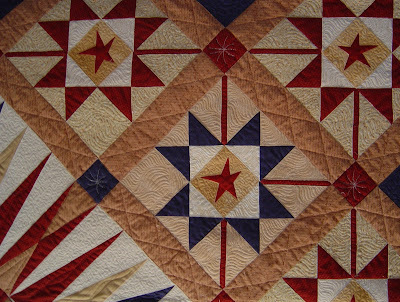 : Have you made other red, white and blue quilts? Judy Laquidara: I have. 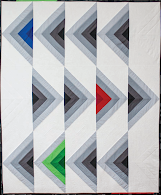 Here are a few links: Finish #3, Finish #4, and Quilt for Fort Hood. Q.I. 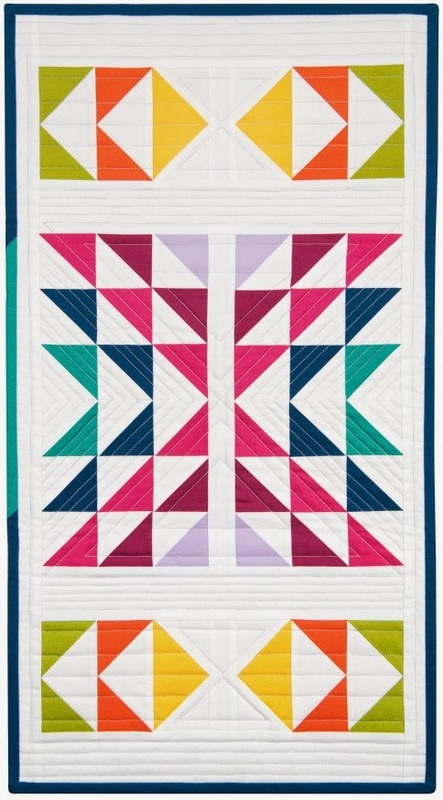 : What is your favorite part/element of the quilt? Judy Laquidara: I love it all! In the evenings I sit and "doodle" with Electric Quilt and do most of my designing then. I look forward to that in the evenings when I'm sitting with no pressure to finish a project. I love the piecing. There are times when all I want to do is piece even if projects waiting to be quilted are piling sky high. I love the quilting and once I get a quilt loaded on the longarm, I don't want to stop until it's done. I don't mind the binding but I often let the quilts needing binding pile up. The good thing about binding is that once it's done, I have a finished project! Of course, buying fabric is lots of fun too! Q.I. : Thanks so much for your inspiring work and for your blog.... we love reading the Patchwork Times! The birthday of the United States of America — Independence Day — is celebrated on the Fourth of July. The holiday commemorates the adoption of the Declaration of Independence on July 4, 1776. The Declaration of Independence is perhaps best known for its second sentence, a sweeping statement of human rights: We hold these truths to be self-evident, that all men are created equal, that they are endowed by their Creator with certain unalienable Rights, that among these are Life, Liberty and the pursuit of Happiness. In honor of the upcoming holiday, we've selected a few outstanding red, white and blue quilts that serve as powerful reminders of the spirit of independence - both as a nation, and as individuals. 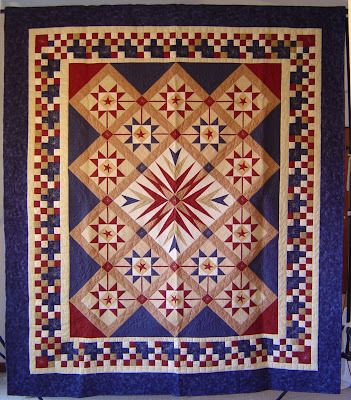 The magnificent "Attic Windows - A Soldier’s Quilt" was machine pieced by Darlene Douglass and quilted by Sandy Henricks of Sun City Quilters. The quilt was presented to a wounded soldier at Ft. Hood, Texas, in April 2008. The red-and-white attic windows are filled with white stars on a blue field, as if we are seeing the American flag through the windows. 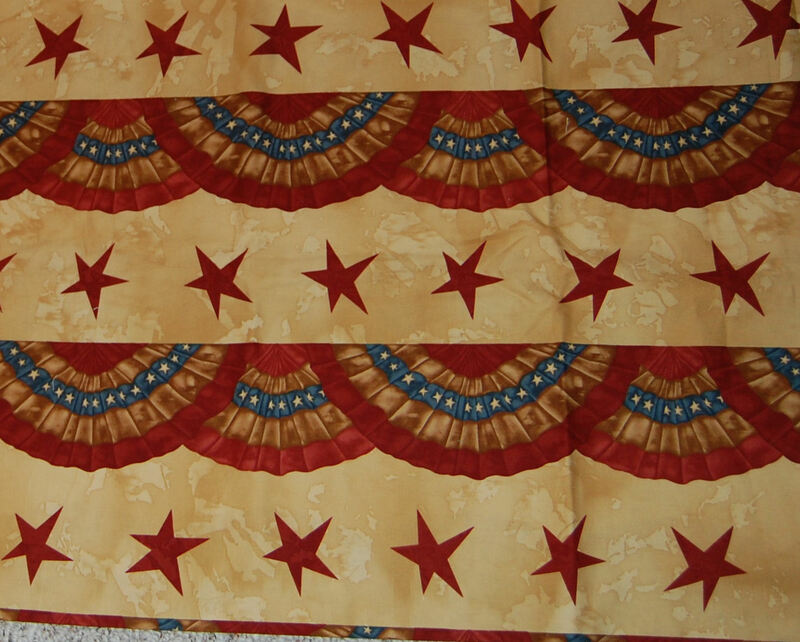 The striking border is made of red-and-white striped hearts festooned with stars. The inscription reads: "Welcome Home! Made for you with love and Appreciation for your courage, Service, and sacrifice for our country. A Sun City Quilter, Georgetown, TX." 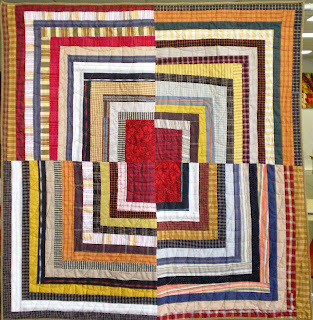 Darlene Douglass creates beautiful quilts of many designs; to view more of her outstanding work, see the Douglass Arts Quilt Gallery. 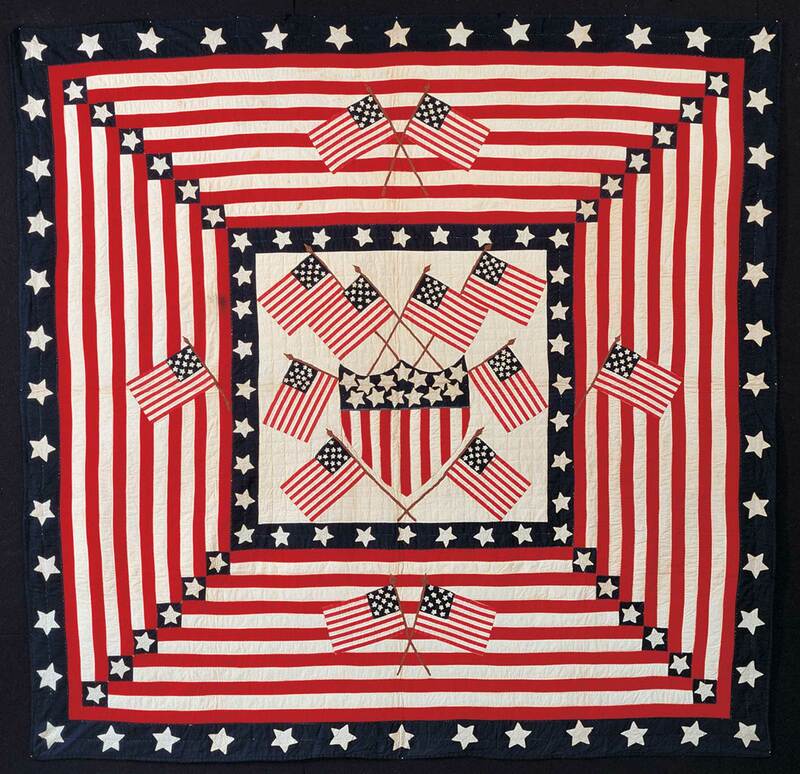 According to oral tradition, the Flag Quilt was made at the time of the Spanish-American War in 1898. 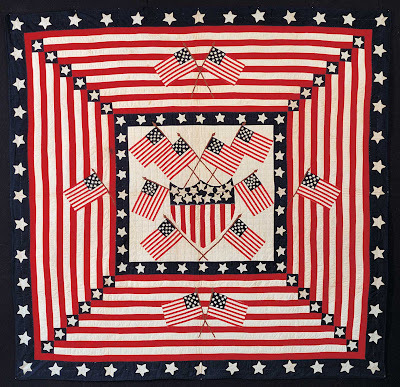 All of the flags and the shield in the center of the quilt have thirteen stars, a reference to the thirteen original colonies. For more information, see this American Folk Art Museum webpage. 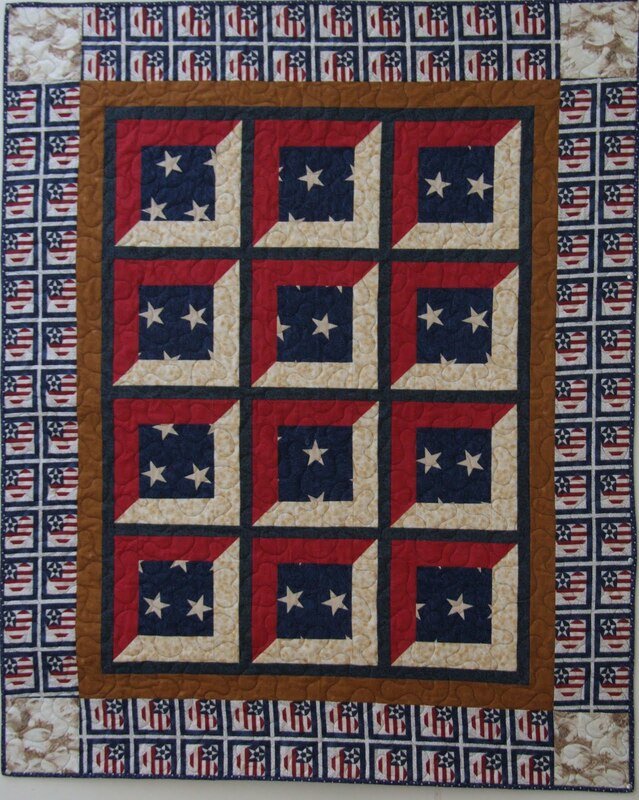 The quilt graced the cover of the 1986 book, All Flags Flying: American Patriotic Quilts as Expressions of Liberty. 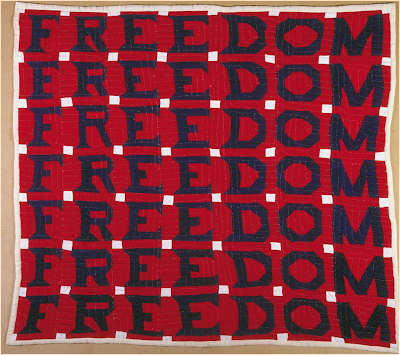 The concept of a freedom quilt can be traced at least as far back as the Civil War, when women were urged to “prick the slave-owner’s conscience” by embroidering antislavery slogans and images into their needlework. This is one of several freedom quilts that Jessie Telfair (b. 1913-d. 1986) made as a response to losing her job after she attempted to register to vote. It evokes the Civil Rights Movement through the powerful invocation of one word, “freedom,” formed from bold block letters along a horizontal axis. 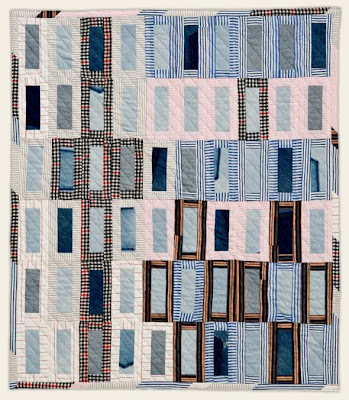 To read about the quilt, see the American Folk Art Museum webpage. Coming up : Stay tuned for our "Celebration of Freedom" post this Wednesday - it's a launch party for a spectacular quilt pattern! Image credits: The quilt images above are shown with the generous permission of Darlene Douglass and the American Folk Art Museum, respectively. Dresden Plate Quilts occupy a remarkable place in quilting history because of their unique round shape and their ability to use even the smallest scraps of fabric to make a balanced, orderly, eye-catching pattern. 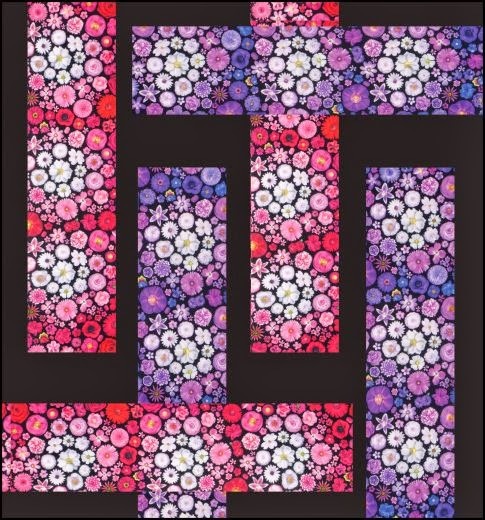 Judy Anne Breneman of Patterns From History tells us that the Dresden Plate block was named after the ornately decorated tableware of Dresden, Germany; and these quilts brightened many a household during the Great Depression of the 1930's. 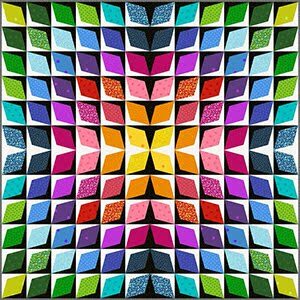 The pattern is still popular today, since all types of fabric can be combined together to produce a cheerful, pleasing quilt which brightens even the simplest of rooms. Judy is offering a free Dresden Plate pattern, with several variations, to help you easily get started on a fun project. 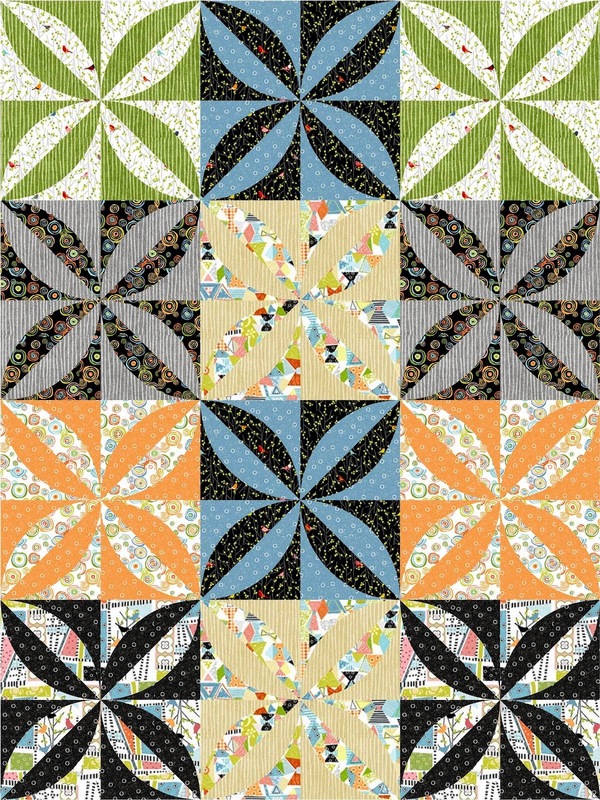 Allison Harris, creator of the popular website CluckCluckSew, displays a pretty Dresden Plate Pillow that provides a great example of the construction of this popular block. 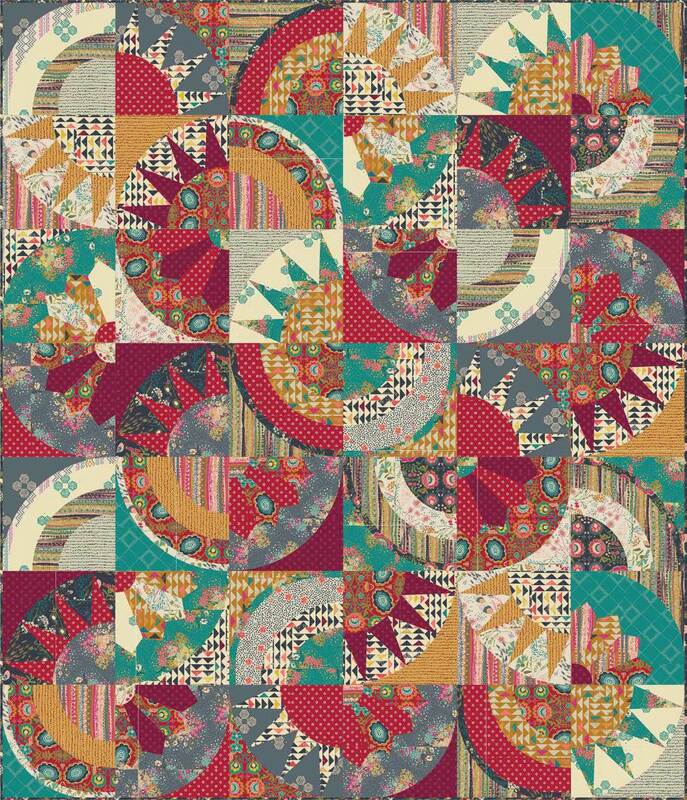 She uses fabrics in very small, colorful calico type prints, reminiscent of the fabrics of the 1930's and 1940's. 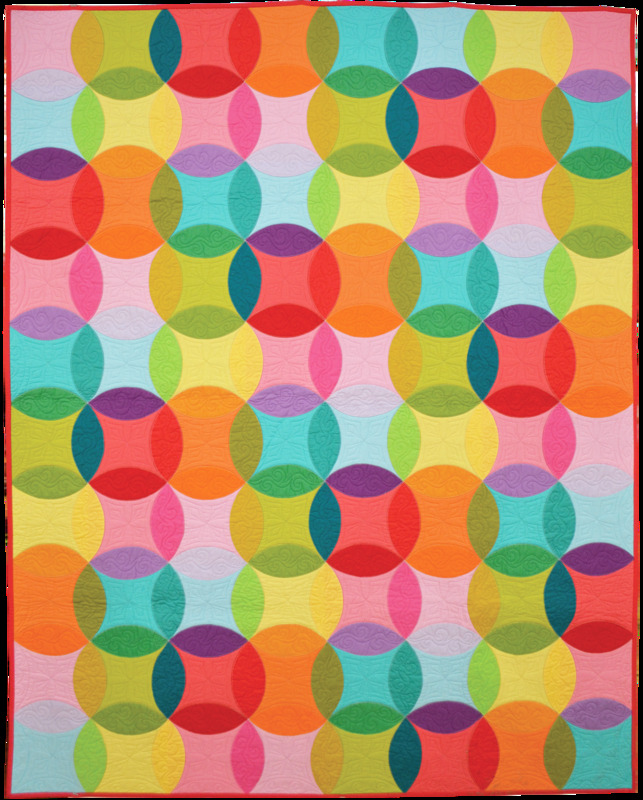 In this case, Allison used a sturdy plastic template from EZ Quilt to cut out 20 small segments, then she seamed them and joined them in a circle. 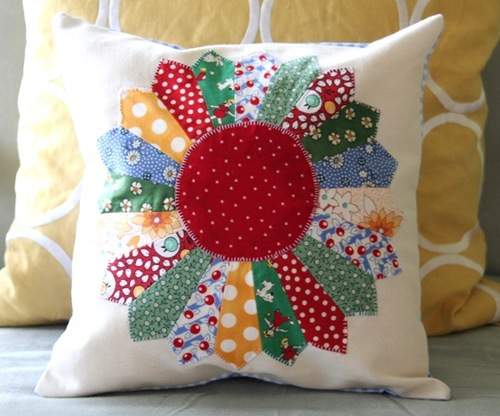 After appliquing them to the pillow fabric, she added the red center and carefully machine stitched around the edge. 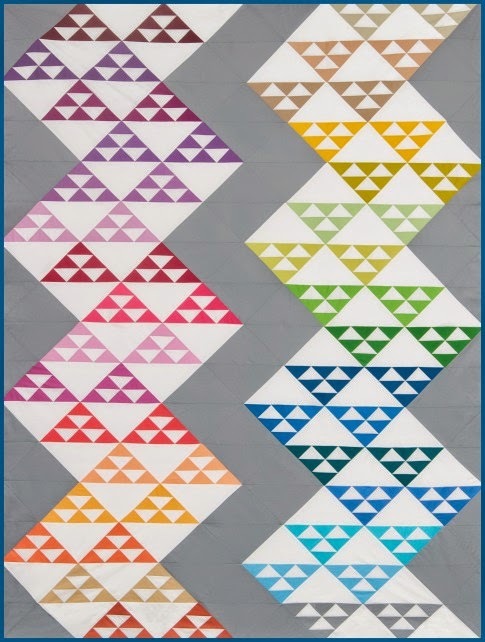 Allison chose Dresden Plate segments that are pointed on the ends, but as you will see in quilts displayed below, it's possible to create segments which are rounded, flat, or alternating sizes at the tips. 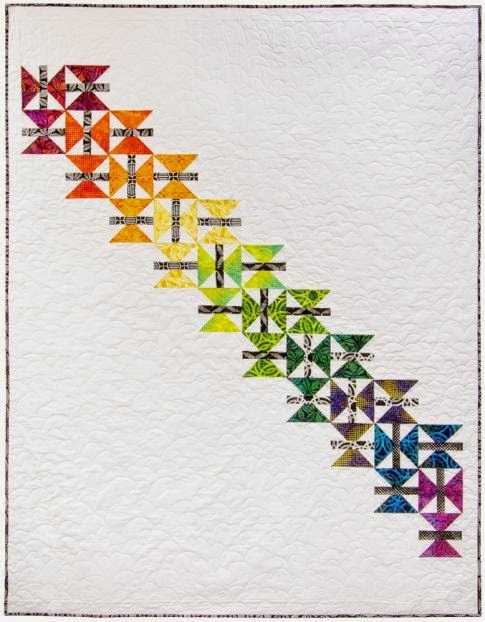 Edyta Sitar, author of the fascinating Friendship Triangles and Hop To It books, shows us a contemporary Dresden Plate quilt, using rich, deep batik colors. 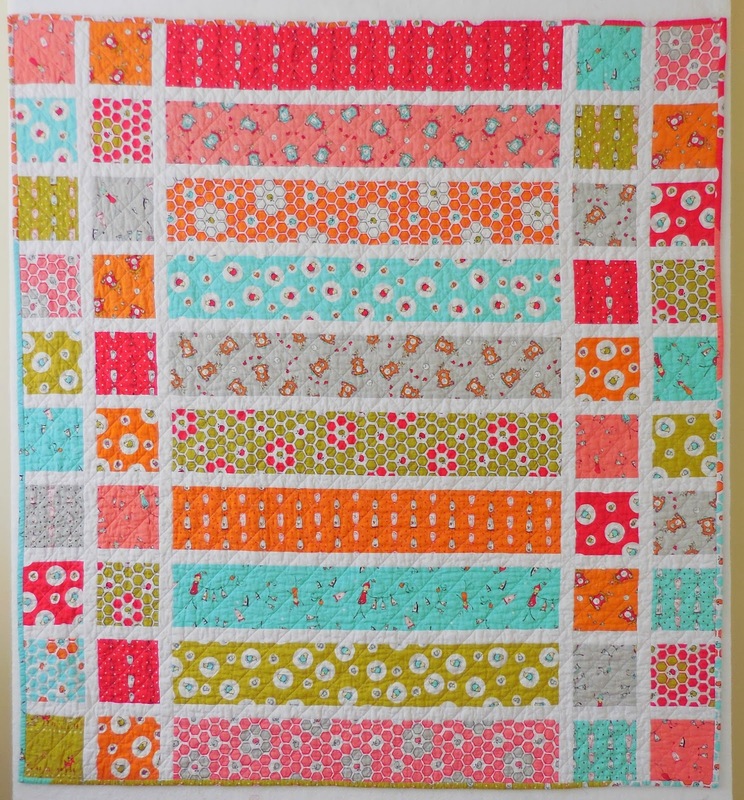 This is an updated look, as solid colors or tonals are used in place of small calico prints. 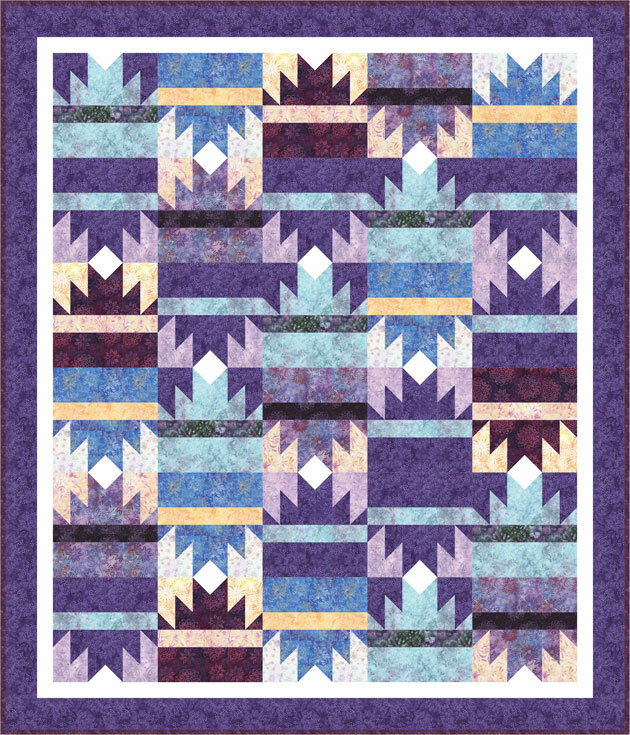 Because the blocks are set against an intricately patterned neutral taupe background, they really seem to "pop" from the surface of the quilt. 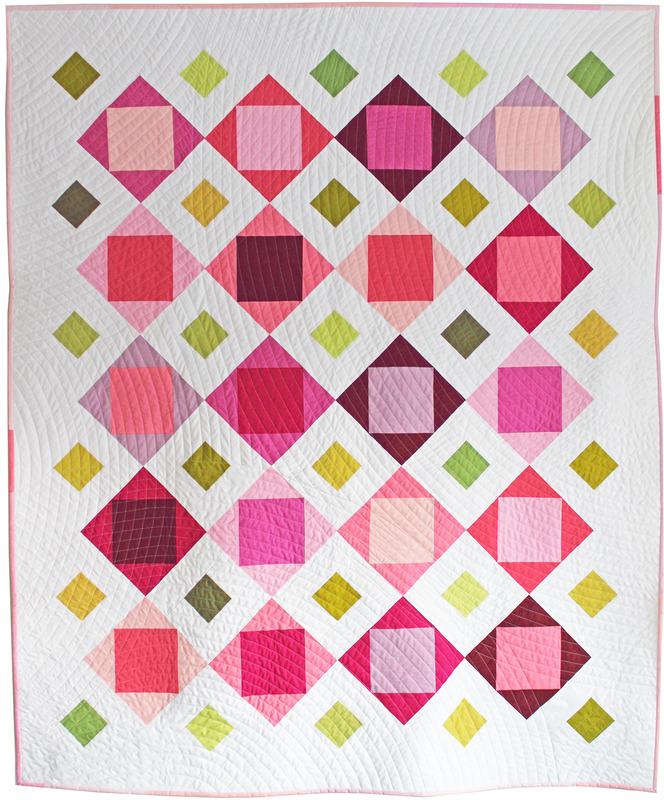 Edyta's carefully written, thoughtful instructions will help you produce this gorgeous quilt. 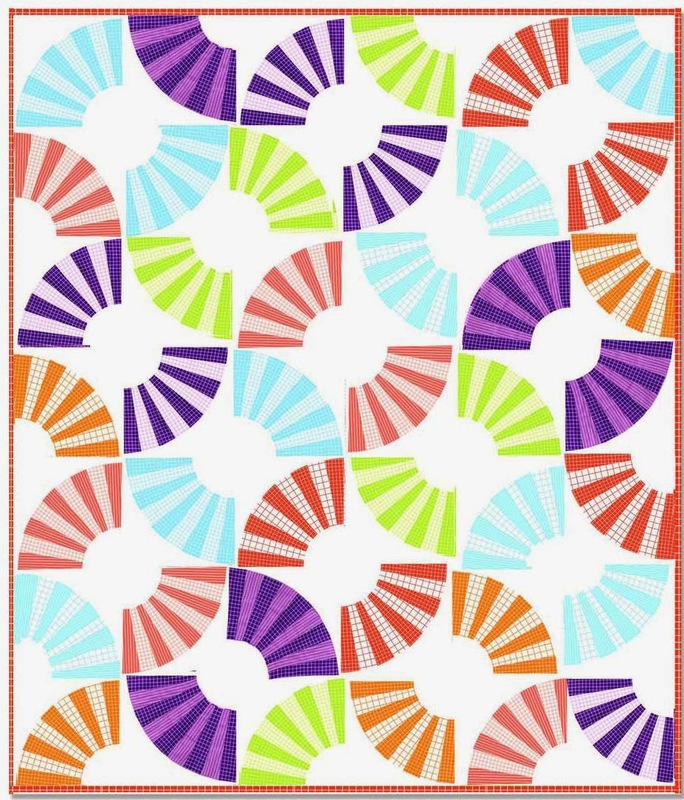 For more "yummy" items, including Edyta's fabric collection for Moda, kits, patterns, and embroidery software, see her Laundry Basket Quilts website. Are you ready for a trip " down under"? Well, let's go ! 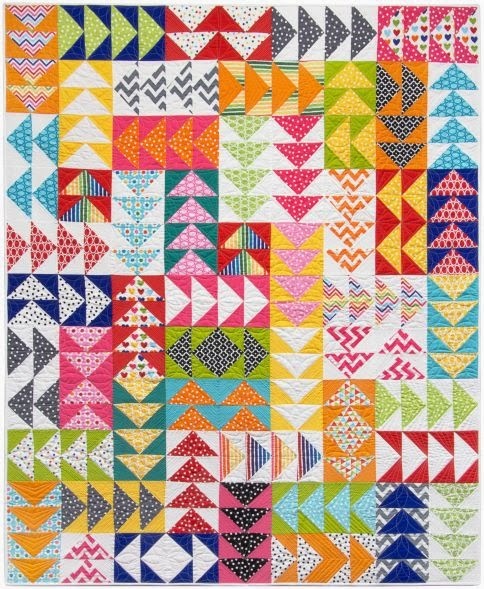 From Brisbane, Australia comes this lively quilt from Jenny Reynold, who belongs to the Queensland quilt guild, otherwise known as QLD Quilters. 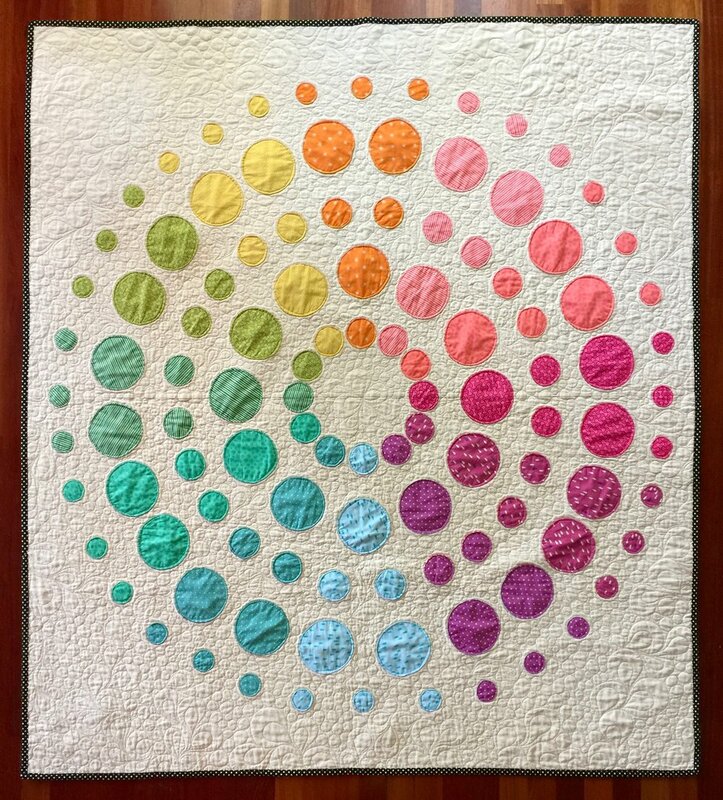 Jenny has done a marvelous job of sewing vibrantly colored large Dresden Plates with beautiful smaller "baby plates" as a means of evenly spacing her quilt blocks. This is a clever way of accurately setting the large blocks without creating too much negative space with the off-white background. 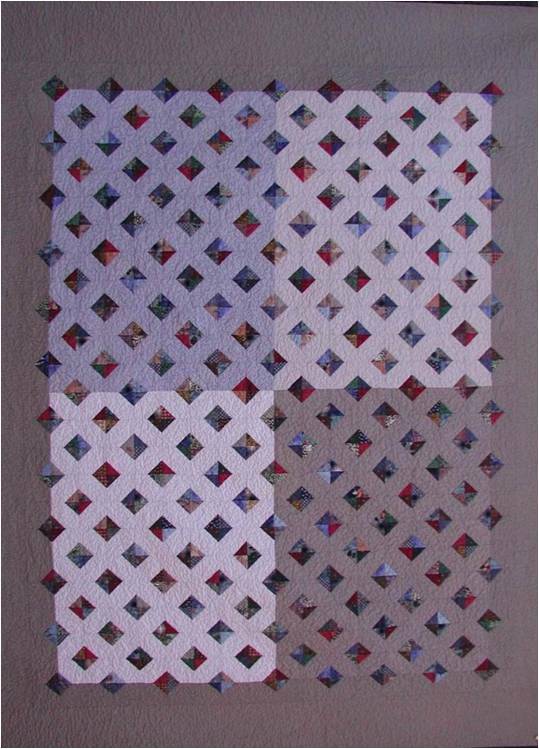 Notice that Jenny has carried out the feeling of rounded movement by creating a scalloped edge, whose curves match the round blocks. For more wonderful quilt photos, as well as the announcement of their upcoming quilt show from Oct. 20 to Oct. 24, 2010, please visit the QLD Quilters website in Australia. 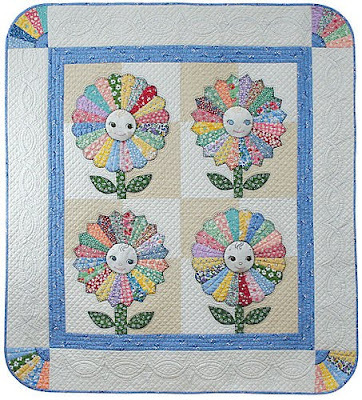 In this adorable baby quilt, the Dresden Plates are treated as sunflowers, with green print stems and leaves. Darcy has appliqued and embroidered faces for the center of each flower. 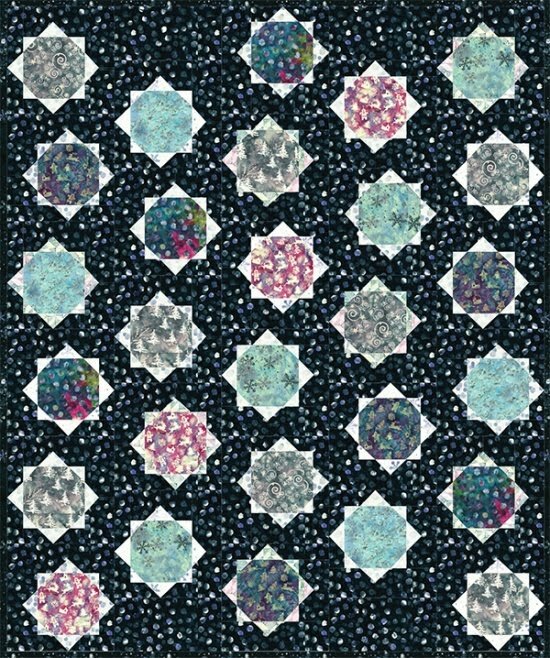 The centers are gently stuffed with fiberfill to help them stand out from the rest of the quilt. 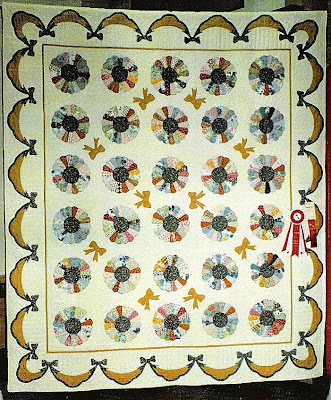 Note that Darcy carried out the Dresden Plate theme to the corners of the quilt, where partial plates tie in the corners with the center design. For this and other inspiring books and patterns, take a look at Darcy's wonderful Ashton Publications website. 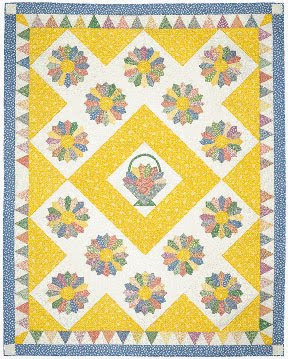 This sunny quilt pattern has a charming basket medallion in the center, which is actually a Dresden Plate bouquet of flowers in a basket. Instead of the standard square block setting for Dresden Plates, the blocks are set "en pointe", creating a pretty diagonal effect. As a bonus, this pattern also comes with a really cute Dresden Plate Homecoming Wall Hanging pattern. 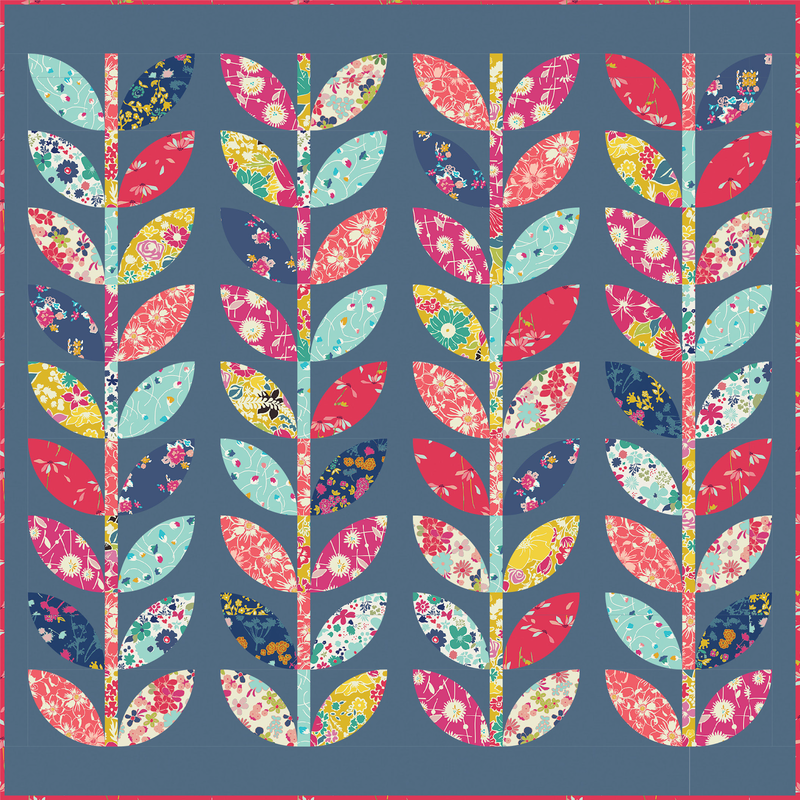 You can purchase the pattern at From Marti Michell: Home of the Perfect Patchword Templates. 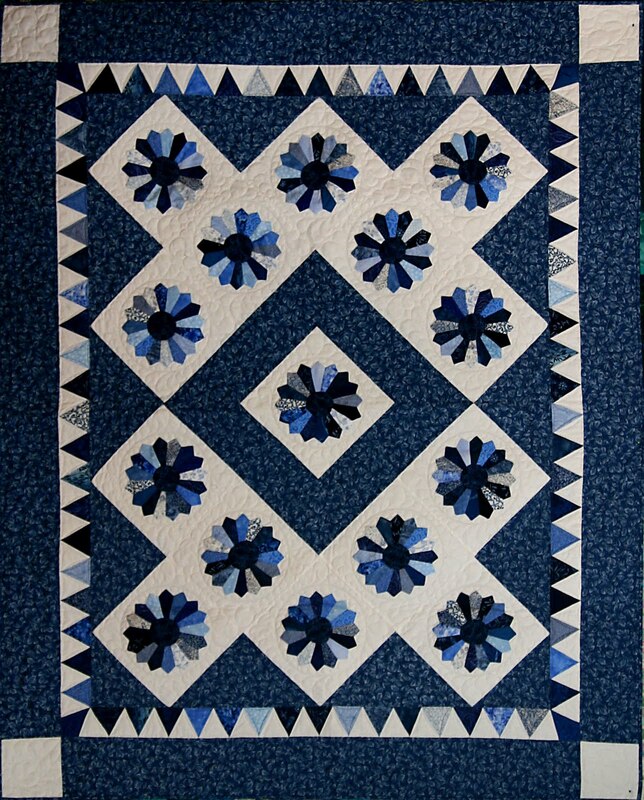 A well-known quilt teacher and designer, Marsha writes that she had many pieces of monochromatic blue scraps left over from a previous project, so she started handpiecing Dresden Plate blocks to see how many she could complete. She also chose a diagonal, non-traditional setting these blocks, which look beautifully balanced and very symmetrical, next to their sawtooth border. 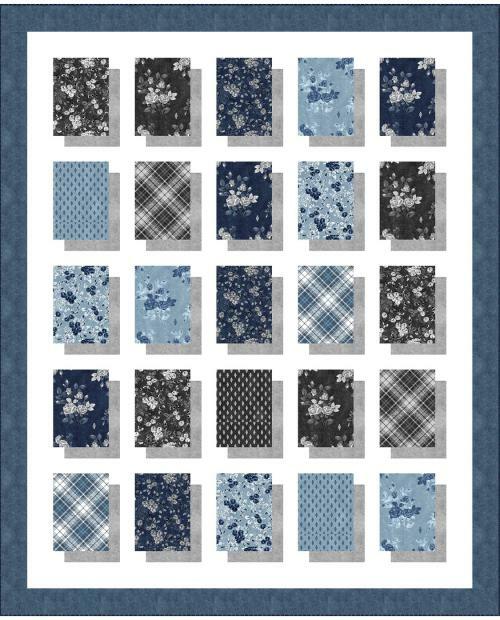 The sophisticated navy and white contrasting colors add to the dignified and elegant effect of this quilt. 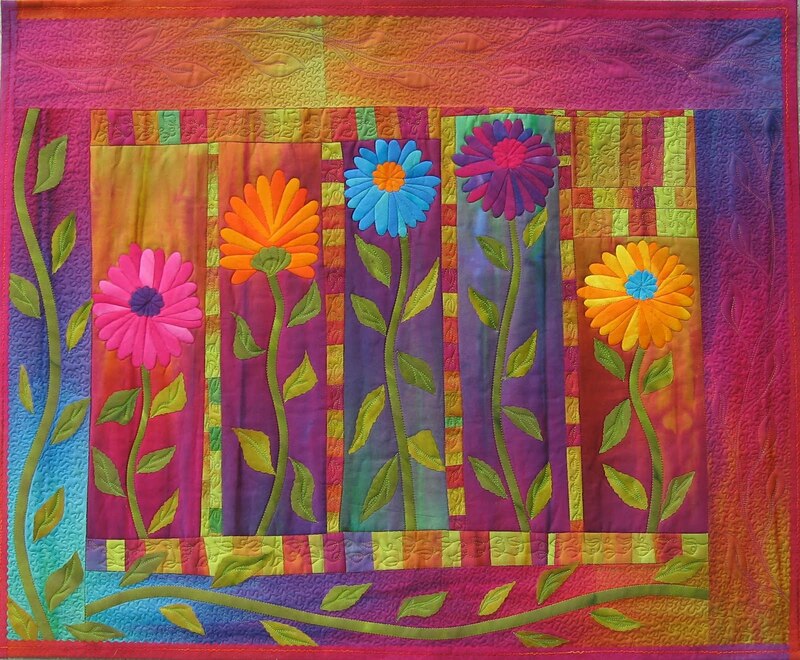 For more stunning quilts and creative ideas, visit Marsha Bray's website. 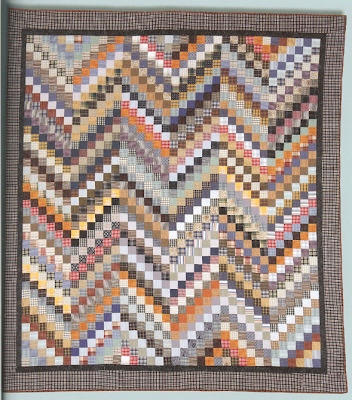 Round Robin Raffle Quilt by West Virginia Quilters, Inc.
For their Quilt Festival from June 24-26 2010, quilt guilds throughout West Virginia lovingly pieced this fabulous 93" square raffle quilt, with a very original variation. 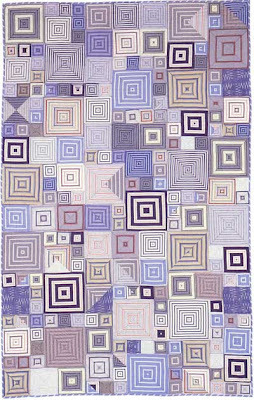 The Dresden Plate blocks are constructed in one half and three quarters round sizes to form part of the quilt's inner border. 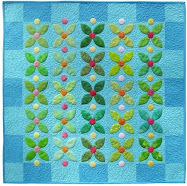 This variation creates a flowery complement to the appliqued vine as it dances around the center patchwork. If you're near Summersville, WV from June 24-26, be sure to visit the festival and enter the raffle. Raffle tickets are a bargain: $1.00 each or 6 for $ 5.00. 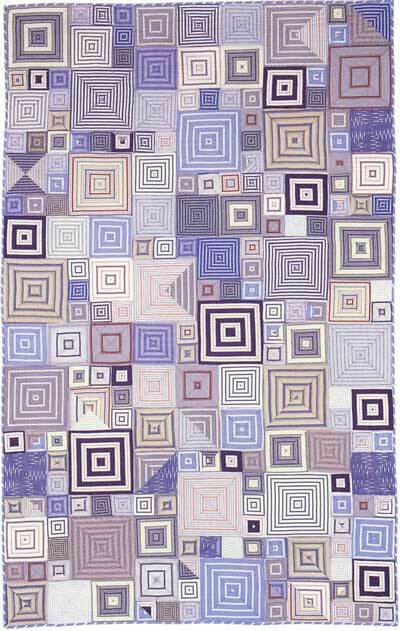 Here's a Dresden Plate quilt whose fanciful and lively swag border matches the blocks and carries out the circular motif. Located in Ontario, Canada, the Kingston Heirloom Quilters are known for their elaborate borders, and this quilt is no exception. The deep blue print from the center of the plates is used for the bows of the border. The gold fabric of the bows between the plates is also used in the scallops of the border. 27 members contributed over 400 hours of work to complete this quilt, which was later raffled. For more of their beautiful work, please see the KHQ website. Dresden Plates of Distinction by Sharon Stroud; her website is here. 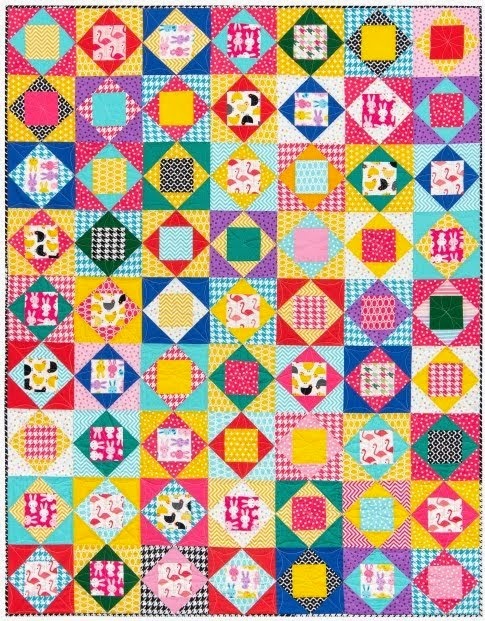 Traditionally, a “postage stamp quilt” is made up of hundreds or thousands of tiny blocks that are all the same size- about the size of a postage stamp. But have you ever seen quilts that look like real postage stamps, commemorating cities, states and other places in glorious detail? 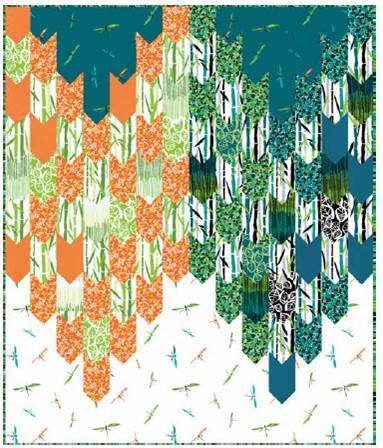 The designs, by Debra Gabel at Zebra Patterns, reflect not only Debra's creative vision but also her background in graphic art and design. Looking exactly like a stamp, there is even a serrated edge on the inner border of these quilts. 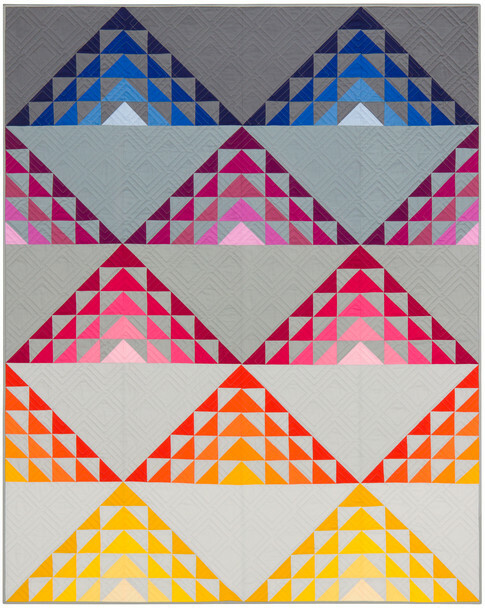 We’re so enamored of these little quilts! 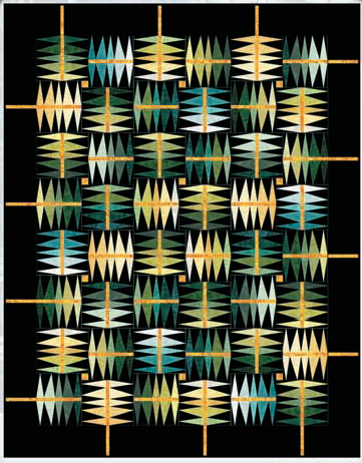 The patterns use raw-edge applique, and make a 24 x 30” finished wall hanging. And here’s the latest cool development: fabric panels, with the identical images pre-printed on the panels. Simply sandwich a panel with batting and backing, then quilt! A set of three would be a great way to brighten up a hallway. 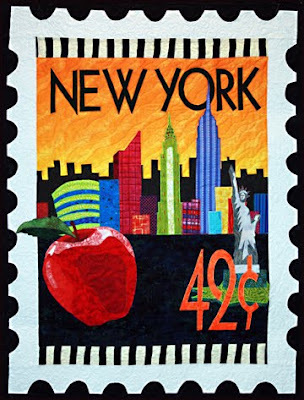 Right now the CityStamp™ and StateStamp™ collections include New York, Washington DC, Baltimore, Chicago, California, Texas, and more (the entire catalog can be seen at Zebra Patterns). Let’s say you live in Alaska or Hawaii, though... is your home state available? Read on for our direct interview with Debra Gabel, and some very exciting news. The New York CityStamp™ quilt, shown above, has the Big Apple, of course, and the Statue of Liberty, set against the magnificent skyline of the city. 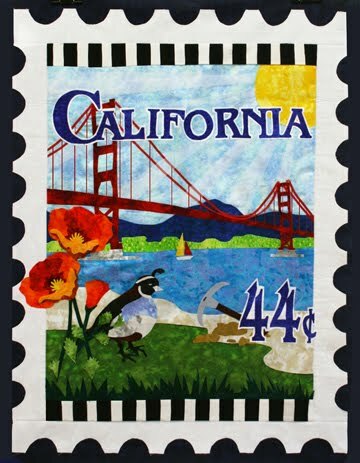 The colorful California StateStamp™ features the Golden Gate Bridge and San Francisco Bay, the state bird (quail) and flower (poppy), a mining pick and a mound of gold, and plenty of golden sunshine. Debra Gabel has also designed a Beach GetAwayStamp™, below, which perfectly captures the serenity of the sand, water and sky. Q.I. : Why is it called Zebra Patterns? Q.I. 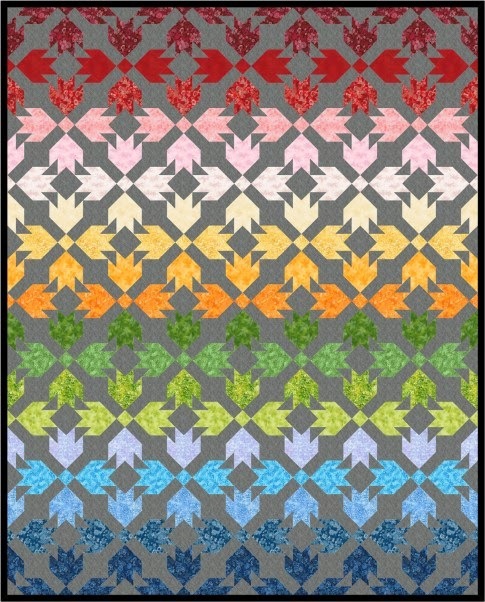 : The stamp quilts look very detailed. Are they complicated to make? Debra Gabel: The stamps are detailed and that is why they are so recognizable. However, everything is raw edge appliqued. That means every piece is a simple cut out with scissors using a pattern. Detailed work does not mean "hard". There are a lot of pieces. In my case - my patterns take some time - but are not hard. You cut the pieces and fuse them in place. Some patterns have relatively few pieces and some have many. All patterns are done in the same manner. 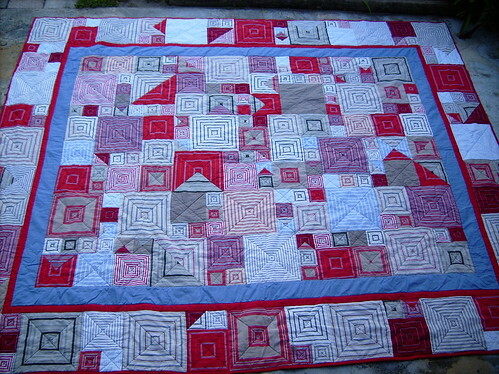 I have had some quilters love the stamp but feel much to intimidated to even try what they feel is a complex piece. I heard those quilters. I came up with the idea of printed panels of every state that I have a stamp for. They are fat quarter size and the quilter only needs to sandwich the quilt and quilt the top to the back on the lines and the stamp looks great! Stitching on the lines gives the appearance of pieced fabric to most non-quilters. 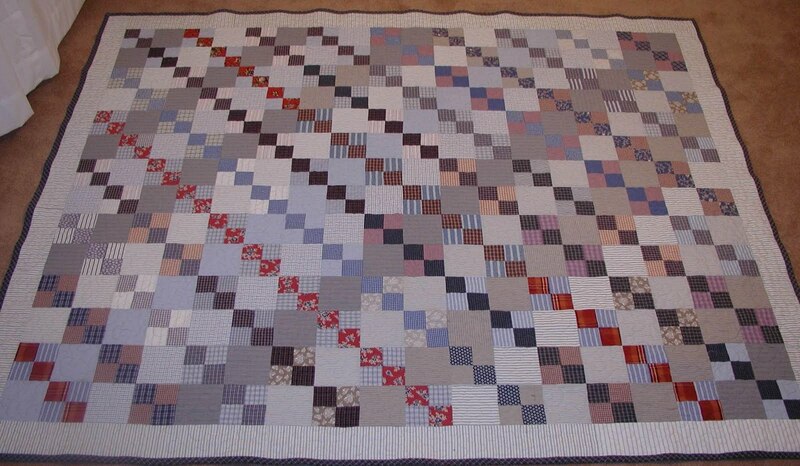 It is also a great way to practice quilting and end up with a great project! Those were so successful that I spun it off into another product - a mini panel. The mini is great for mailable quilted postcards, featured as a focus fabric, pockets on a tote or for mini quilts. Q.I. : We also noticed your wonderful art quilts. What is your favorite part of quilting: designing patterns, or making original art quilts... or are you torn between the two? Debra Gabel: I really love it all! I am really enjoying seeing my business blossom. This past market in Houston I have been approached by so many large manufacturers it has been great! I find it so rewarding to listen to what quilters want and design things for them in my style to meet their needs. My intention is to create timeless patterns. Flowers, butterflies and state landscapes certainly fit that profile. These designs come to me easily and flow nicely. My art quilts are made for one of a few reasons. When I feel I need to "say" something and work through inner turmoil I create. 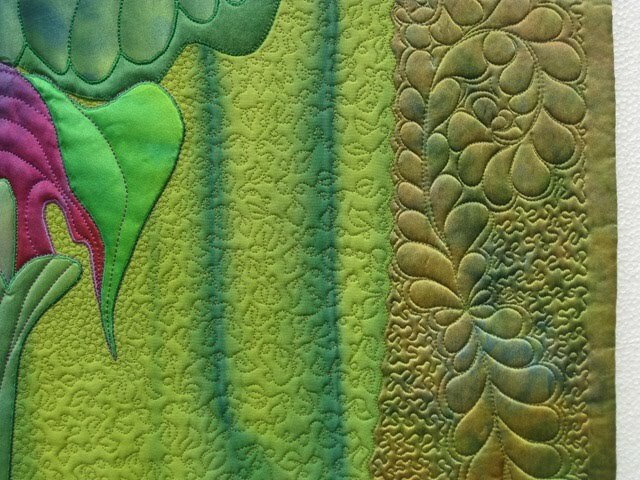 My "Aqua Aurora" was the first art quilt I did after having a bone marrow transplant for Non-Hodgkins Lymphoma which is imagery of a tree girl with her roots in chemo that flushes through her system and cleanses her. I enter many challenges as I love to compete and the defined subject matter makes me think out of the box. Lastly I quilt as gifts. I try to really go above and beyond with my gift quilts. See my chuppahs. Debra Gabel: Yes - I am planning to continue with the states and the cities. I get satisfaction by providing the customer with something the customer can really relate to. Quilters are passionate about their home state and or cities. They get so excited when they see all the familiar state symbols/landmarks arranged just for their state or city! 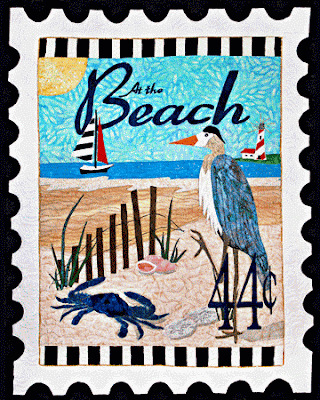 Many collect several stamps and make a large sheet of stamps into a larger throw quilt or even a bed quilt. I would love to hear your ideas. Q.I. : Your stamp quilts remind us so much of travel posters, like the great airline and railroad posters with their gorgeous scenery. Soooo… we’d love to see stamp quilts for the great travel destinations of the world - cities and countries (London, Paris and Venice come to mind!) But first: we understand you have a new book coming out with C&T publishing late fall 2010. We'd love to know more about it - what can you share about the book? Debra Gabel: I do! I was approached by C&T publishing after fall market in Houston to do a book about my stamps. It just so happened that I was in the process of writing my first book! Based on all the requests at market for various states - I decided I would make a book of 50 patterns - one for each state so that quilters could make quilts with particular states of meaning. That was discussed and we turned the book around in record time. It will be released in catalogs in Oct 2010 at market in Houston and be shipping in December. It is all very exciting! My intention is to make this one of those books that most quilters must have! It is a plethora of designs - even if the consumer does not make the blocks. 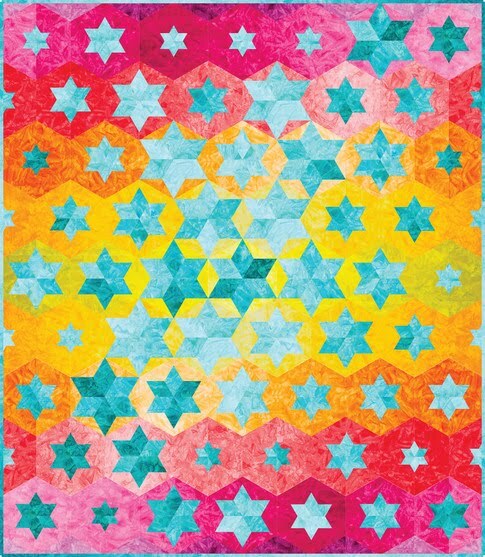 There are hundreds of graphic images to use in quilts. 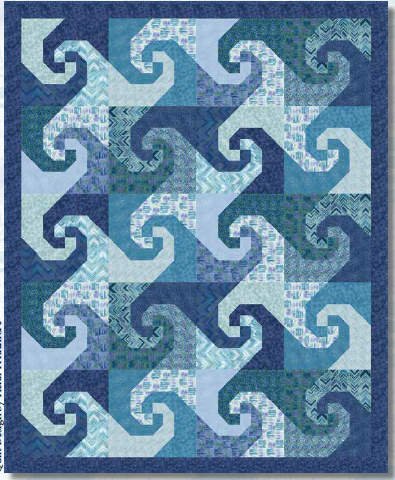 The book will have a specially designed lay flat binding so that quilters can copy images. It has a NEW pattern technique of translucent patterning! It will also come with a CD!!!! It is all so reasonably priced (can't say price yet) that everyone will want one and each design will cost less than 50-60 cents! Most patterns cost 9.00! Most books have 8-10 projects! Mine has 51! It is so exciting! Q.I. : We can hardly wait to see the book! Thanks so much for your time and for your inspiring designs. Image credits and trademarks: CityStamp™, GetAwayStamp™, StateStamp™ and NationStamp™ are trademarks of Debra Gabel/Zebra Patterns. Images are shown with the generous permission of Debra Gabel. 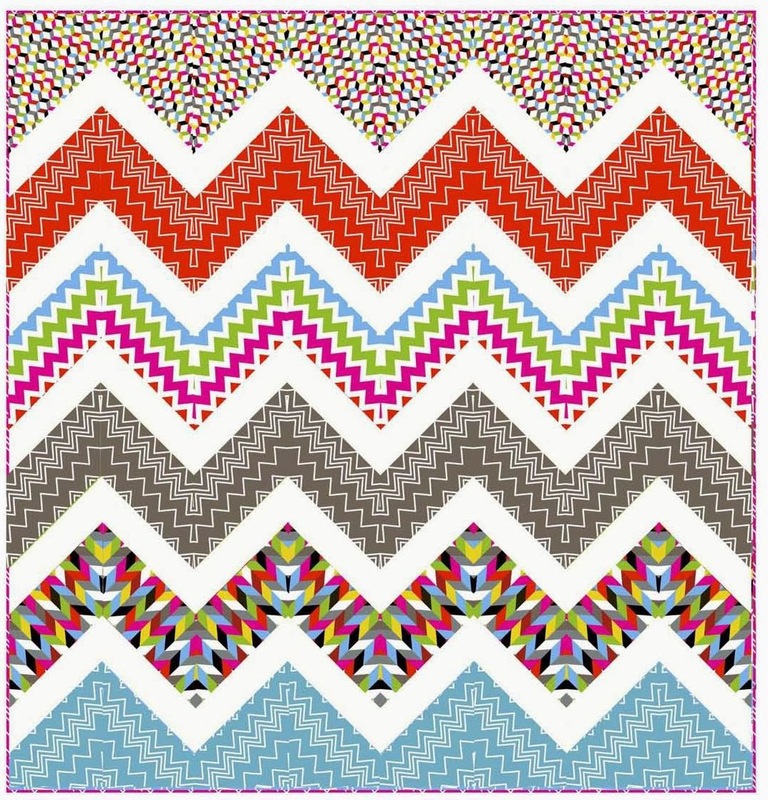 Patterns, fabric panels and other products are available at the Zebra Patterns website. 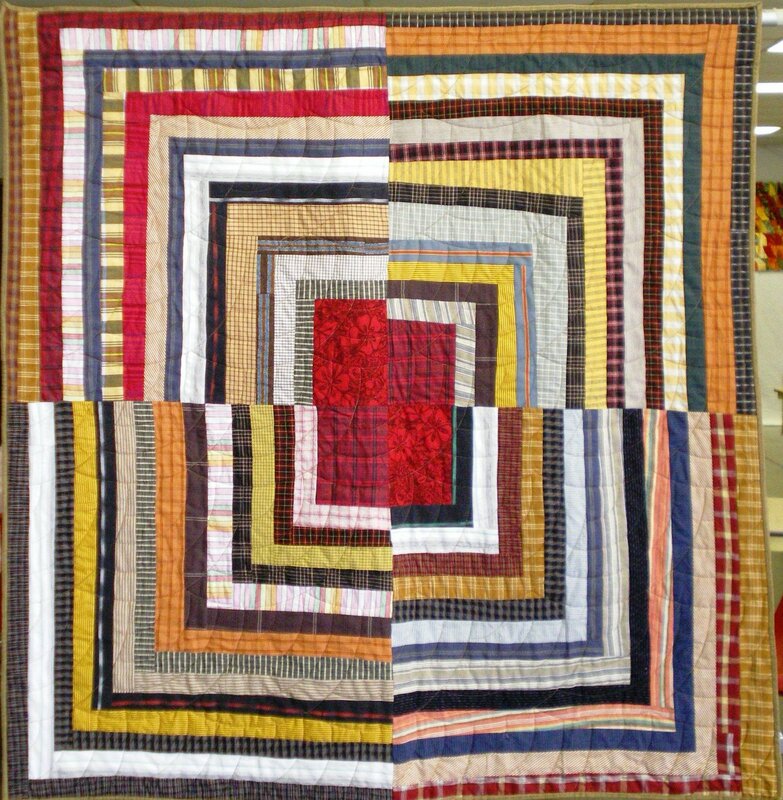 Throughout history, quilters have incorporated recycled clothing into their quilts. 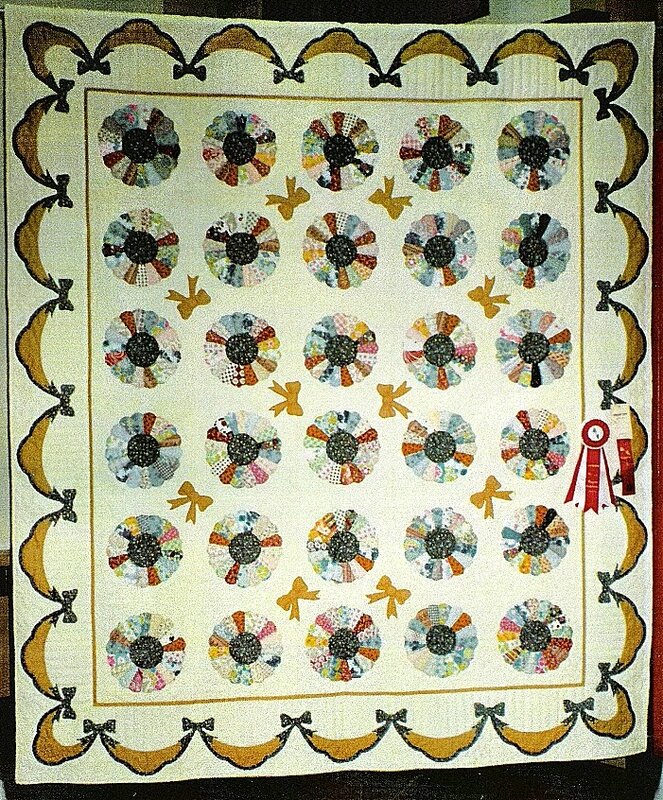 The photo below is of an African American crazy quilt from the early twentieth century. In the south, such quilts were often made as memorial quilts, incorporating bits of clothing worn by a loved one who had passed away. Of course, the re-use of old clothing in quilting was not reserved for such occasions - it was often done out of economic necessity. 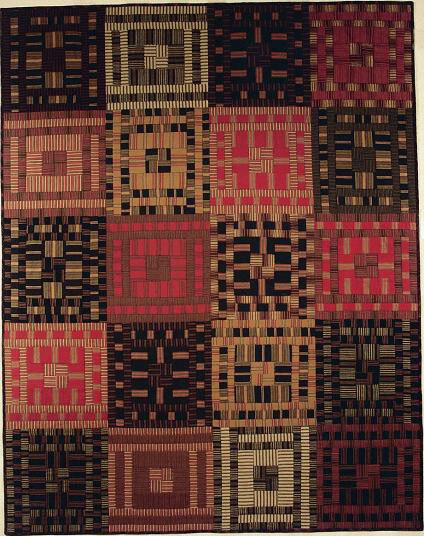 Many examples can be seen in the scrap quilts of the 1930's. These days, the 'green' movement has inspired the use of discarded materials to make new products that are useful and beautiful. And, our economy is inspiring a new wave of thrifty quilting. A recent article in the Times Online (UK) had this headline: Waste not, want not: here comes the new austerity chic. In keeping with the Times...(pun intended)... we’ve searched the globe for contemporary quilters who have taken upcycling to a whole new level. What amazes us is the sheer beauty of the quilts that these artists have created... from used clothing?! 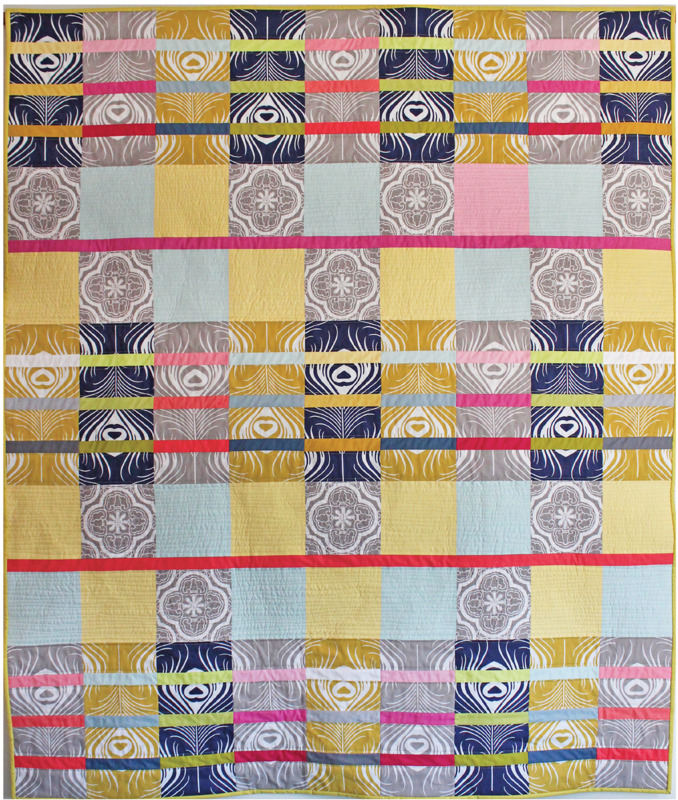 In this beautiful quilt, the plaid, striped and print fabrics create a vibrant design. The quilt reminds us of a work of abstract art when viewed from a distance. Although this quilt is 100 years old, it is in excellent condition. 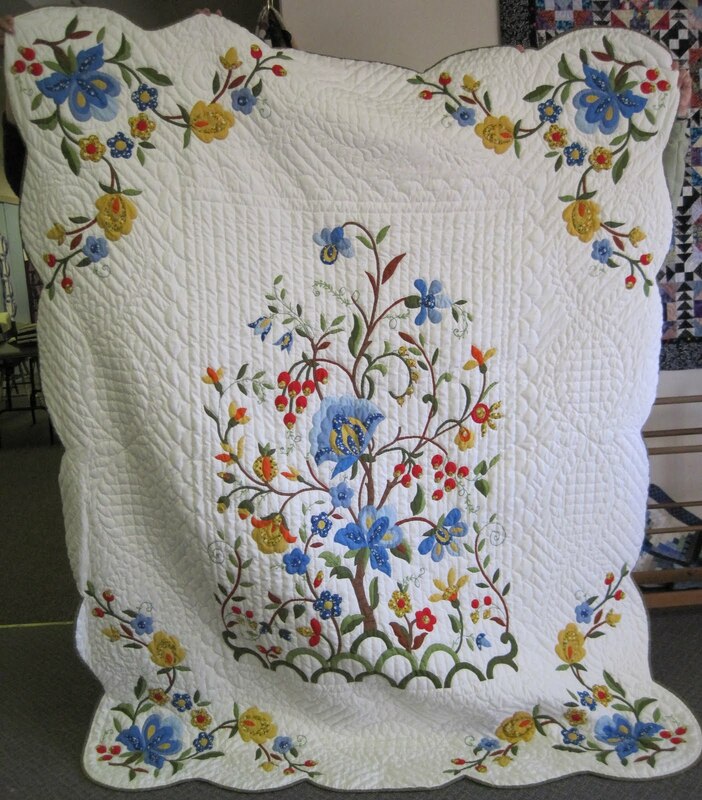 Visit Silkwater Antiques for more quilts and antiques. 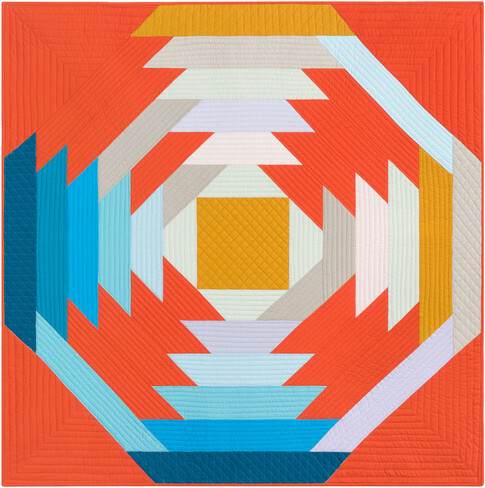 Lori Mason is a textile designer and creator of fabulous contemporary quilts… but that’s not the whole story. Her memorial quilts are made of reclaimed clothing that was once worn by the person whose life is celebrated. Lori works individually with family members to fashion these one-of-a-kind pieces. Eva’s Garden, above, was made in memory of Lori’s own grandmother: it incorporates Eva’s jeans, Oxford shirts, and her favorite pair of gardening shorts. 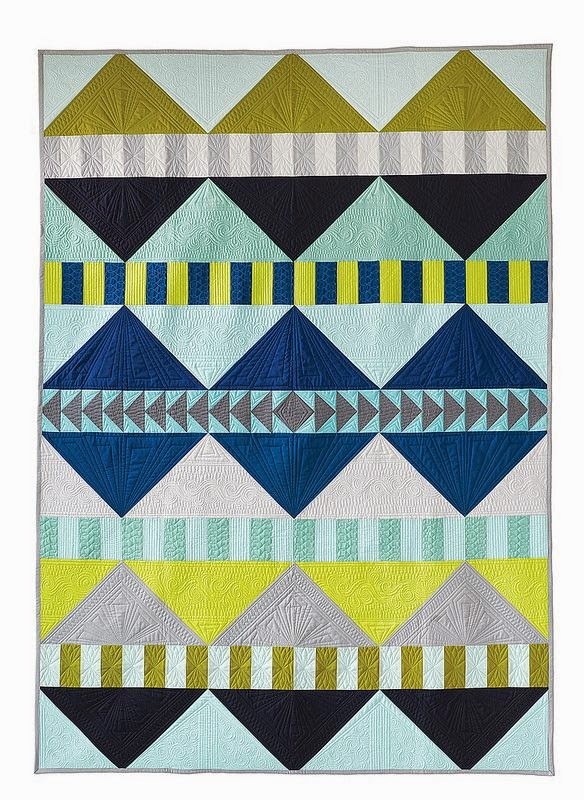 We love the bold graphic design of this quilt and the lively contrasts between the light and dark plaids, stripes and solids... and we love the whole idea of a contemporary memorial quilt, providing solace and beauty for many years to come. Also don't miss the splendid quilt called Eva in New York, which was made from Eva's colorful couture clothing. For more inspiration, visit the galleries at Lori Mason Design. 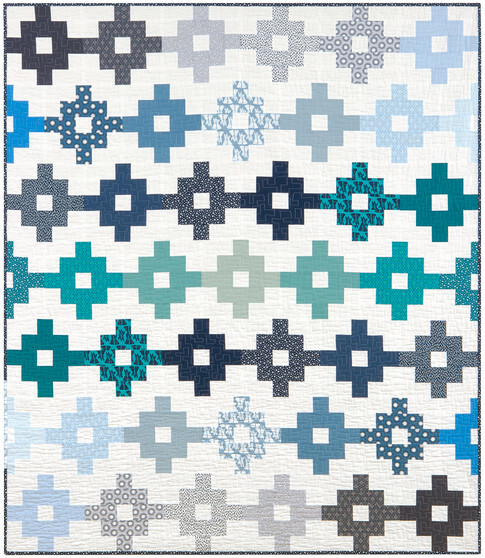 When we came across Ocheltree Design we were immediately struck by the sophisticated contemporary quilts, with their clean lines. 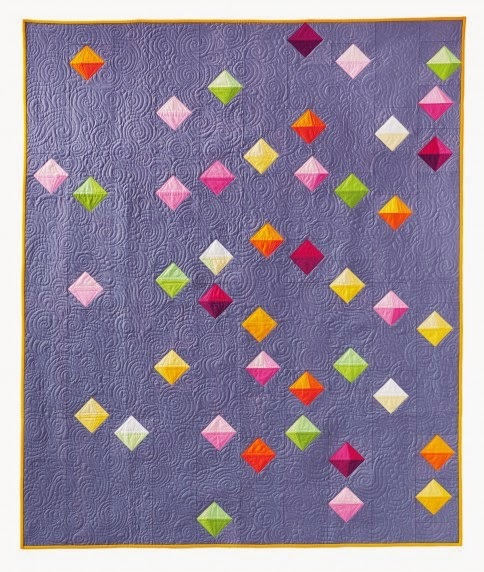 Witness the elegant “Missing the Point” quilt, above. 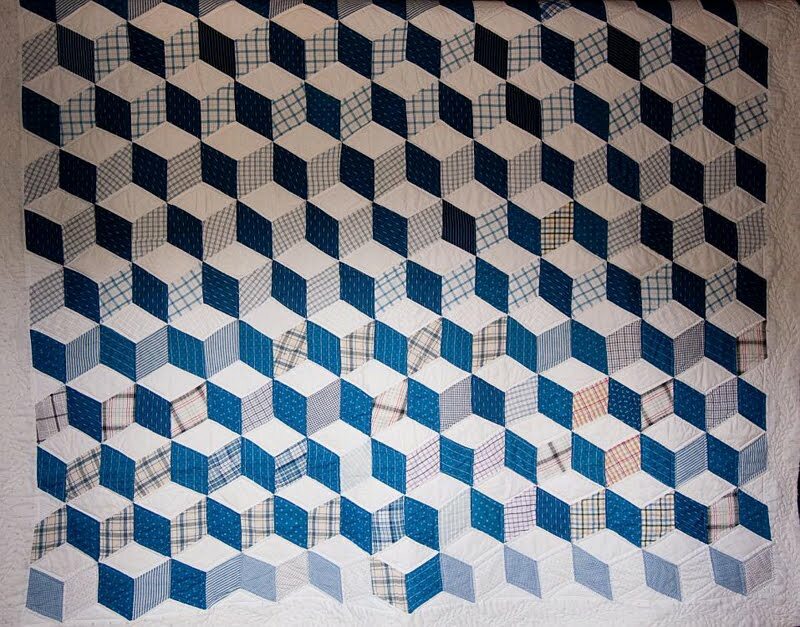 Believe it or not, the quilt is made entirely of recycled dress shirts! The backing is a sumptuous organic cotton sateen. 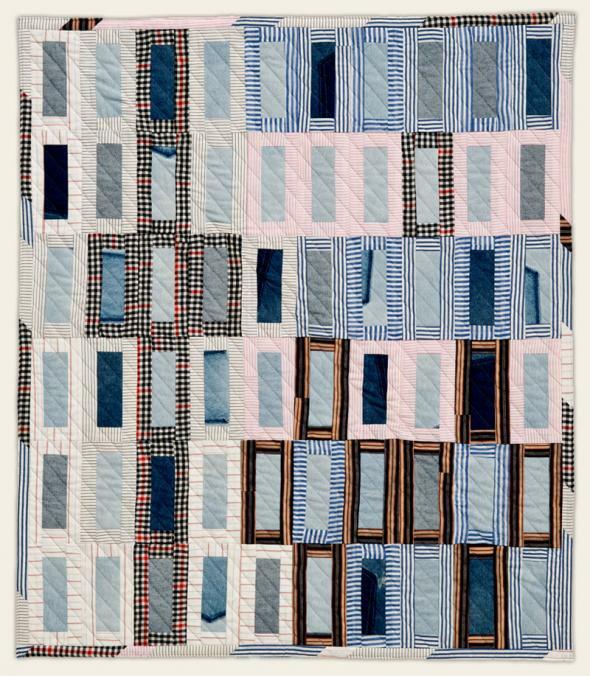 Although Richard Killeaney has an MFA in textiles, we learned that his quilts are designed to be used - not just to be displayed on the wall as works of art. Oh yes: we can easily imagine ‘missing the point’ in a seaside cottage, with whitewashed walls and a view of the ocean (sigh). “Missing the Point” also comes in an ultra-stylish red colorway. 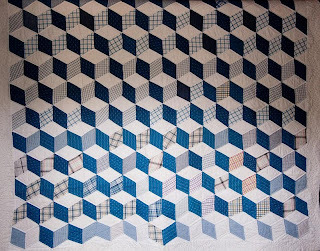 Also don’t miss Richard’s exquisite Full Grid and Golden State quilts. For more quilts, and gorgeous pillows made from recycled shirts, sweaters, and tweeds, visit the Ocheltree Design website. 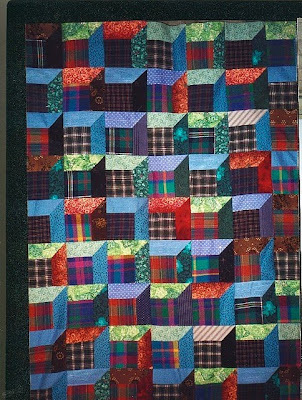 Beautiful blue plaids, stripes and dotted fabrics were artfully arranged to create this fabulous three-dimensional tumbling blocks quilt. 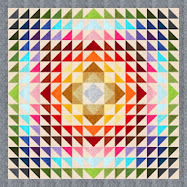 It's one of our favorite optical illusion quilts. 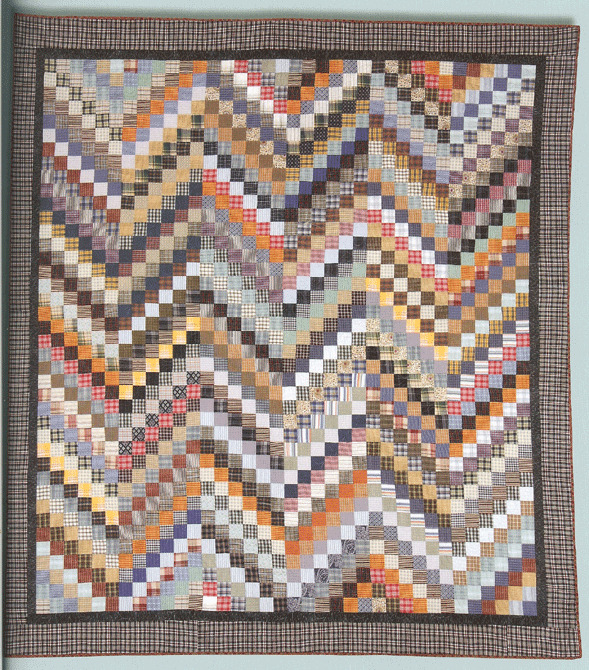 We were surprised and delighted to learn that this quilt was constructed with men's 100% shirting fabrics. The name of the quilt, "The Shirt Off My Back", should have been a clue! 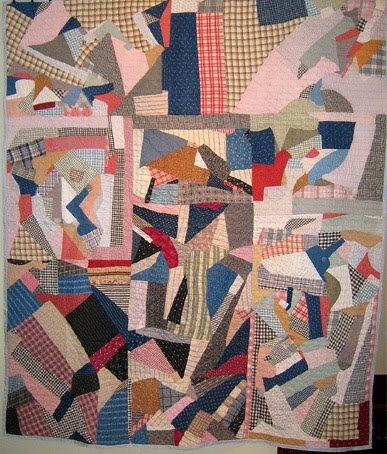 The quilt top was discovered by artist Betty Leppin at an estate sale; she finished and quilted it. Betty creates magnificent hand painted silks, and original art quilts, in her studio near the Chesapeake Bay. 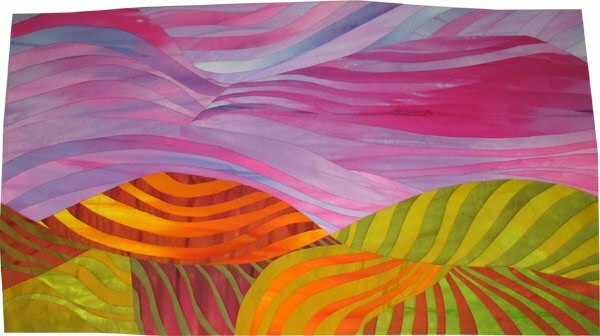 Betty's love of color, composition, and technical details are apparent in her fabric creations, which can all be seen at Silks and Quilts. While perusing the World Wide Quilting Pages (WWQP) we 'discovered' Judy Peterson, aka "JudyPete", aka "WhiteStone". 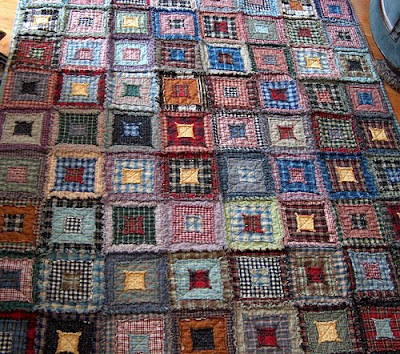 Judy creates magnificent quilts from gently-used shirts and blouses, which she has collected from yard sales, thrift stores and family members. 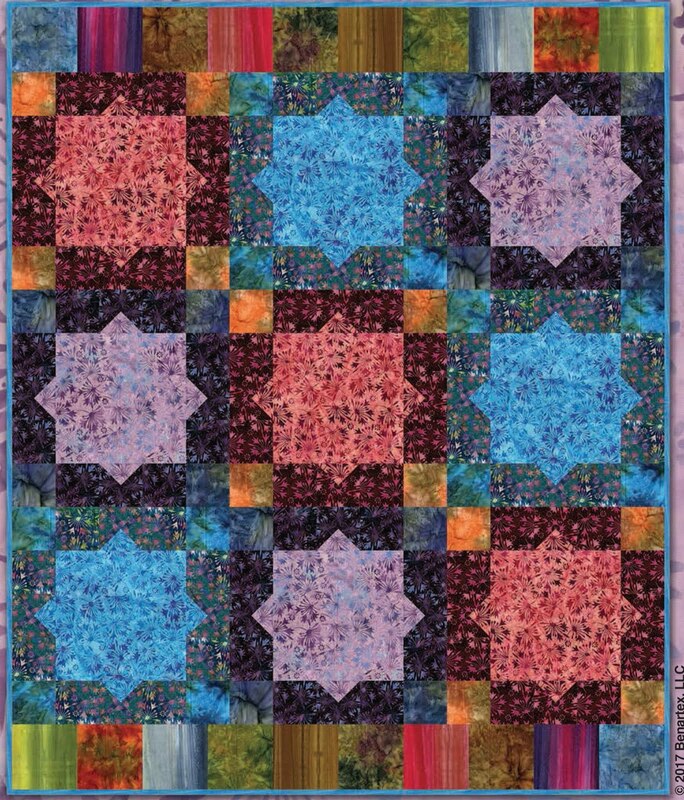 We're showing two beauties: "Manly Quilt" and "Fred's Double Four Patch". 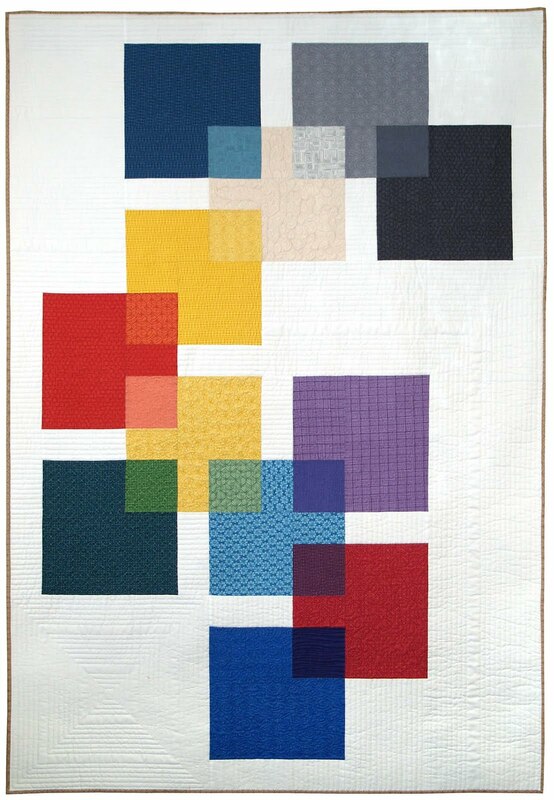 The Manly Quilt was made from four neutral-color men's dress shirts as the solids, plus numerous fat quarters from the quilt shop (click on the image to see the details). 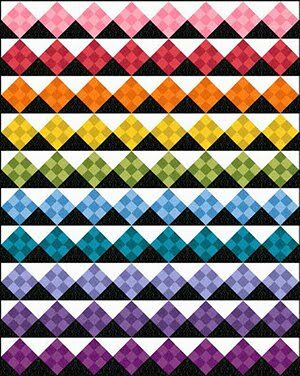 You can read about it on the WWQP (scroll down the page to see that post, and you will also find links to her other Shirt Quilt posts). But wait, there's more: you can learn about Judy's shirt selection methods, and ogle her elegant Lady of the Lake and four patch variation quilts, here. Her own blog is called Wanna Walk Along? 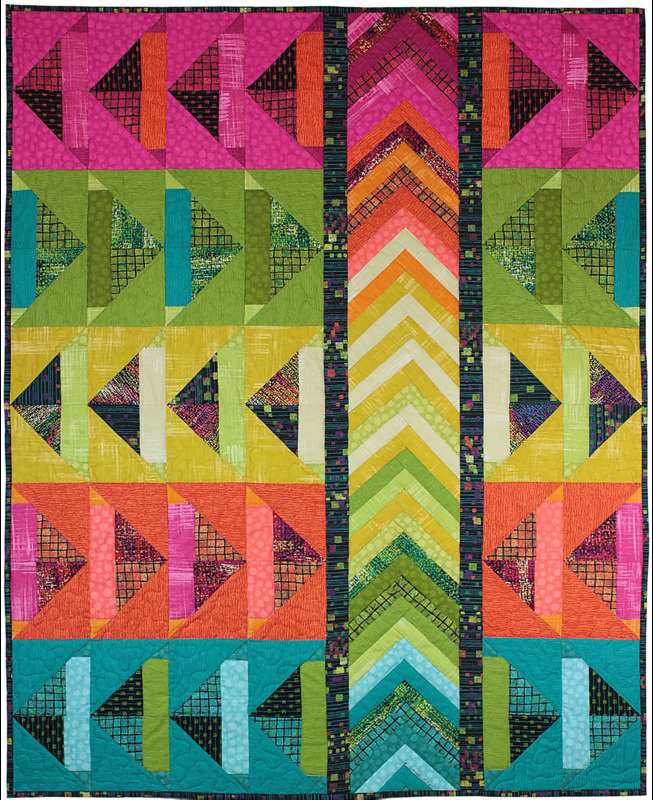 The classy Shirt Stripe Boxes quilt was featured in Kaffe Fassett's Passionate Patchwork: Over 20 Original Quilt Designs , with Liza Prior Lucy, which is just one of Kaffe's bestselling books. The book also has a pattern for "Baby's Corrugated", below. 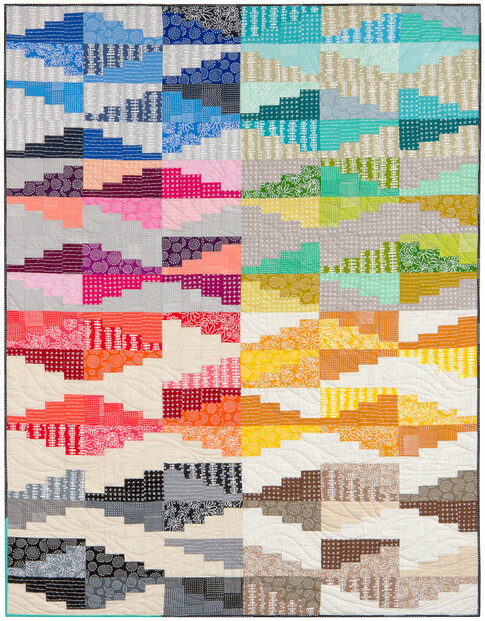 "Shirt Stripe Boxes", with its mitered corners and myriad scrap options, instantly captured the attention of modern quilters and helped to inspire a Reclaimed Clothing Quilt-Along, which now has 67 members! 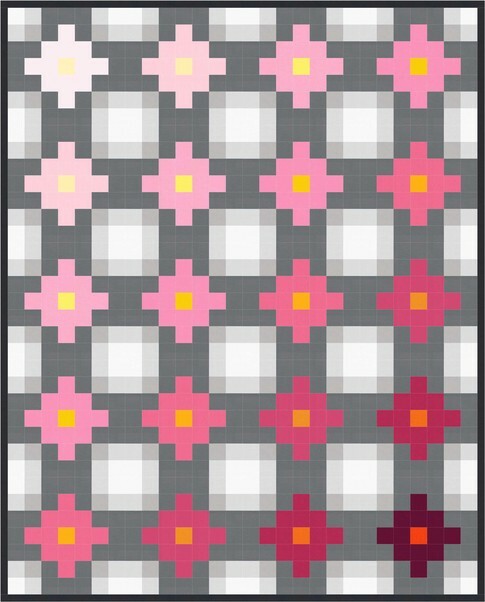 For more information and a link to the quilt-along, visit the Bloomin' Workshop. 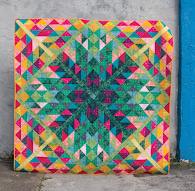 One of the prettiest quilts so far is Brandon's Quilt by jewelry designer Stella Maris, aka polyesterstella. (See her photostream on Flickr, and her website at Etsy). For all of Kaffe Fassett's books and designs, visit the Kaffe Fassett Studio. 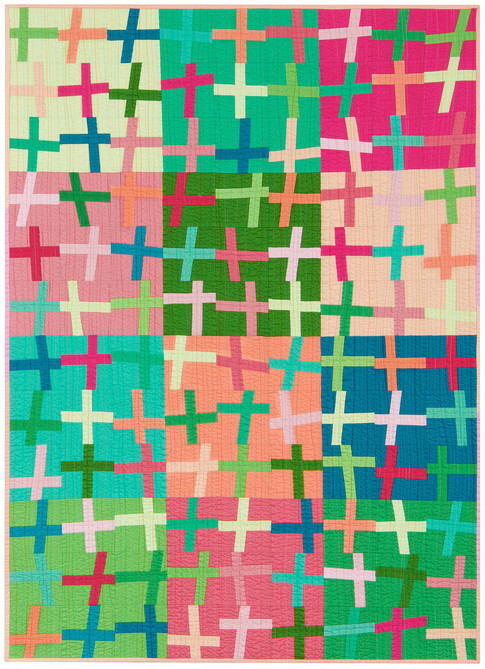 When it comes to quilts made from shirts and scraps, Bonnie Hunter wrote the book (literally). 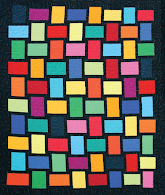 Her "Shirt Tails" and "Bargello in Plaid" quilts, above, are just two of the wonderful quilts in her Scraps and Shirttails book (to date, every reviewer on Amazon has given the book five stars... that says it all!) 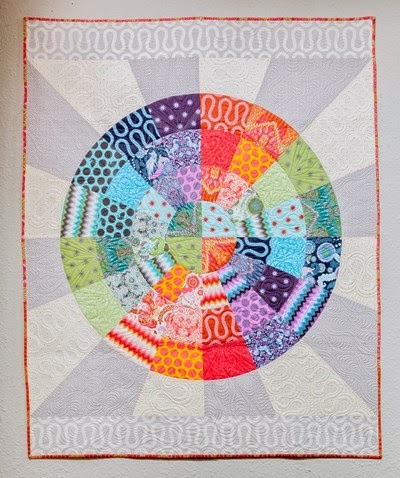 If you visit Quiltville you can see a preview of all the quilts in the book (thanks, Bonnie!) 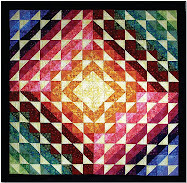 Many more quilts can be found on the extensive Quiltville website. 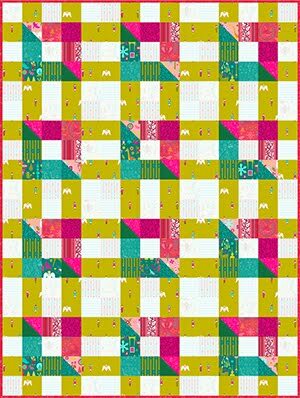 Bonnie's love of quilting and "making do" with scraps really comes through in her entertaining tutorials. Also check out her clever Adventures with Leaders and Enders. We like ordering books directly from the artist, whenever possible; Bonnie's books are available at Quiltville. Stefanie Japel heads up her eponymous design studio, a knitter's paradise that offers original patterns, books, and workshops. 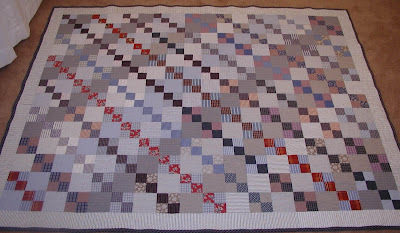 Her Glampyre Knits blog is loaded with knitting tips... with an occasional foray into quilting. After hand-dyeing some yarn one day, Stefanie tossed some fabric scraps into her dye pans, and used the over-dyed fabrics to construct this fantastic log cabin quilt! We love the turquoise-and-persimmon color scheme with its sepia tones. We know about hand-dyeing fabrics for quilting, of course, but usually it is done by starting with new white fabric as a base. Stefanie's ingenious approach/solution has us envisioning a whole new trend. 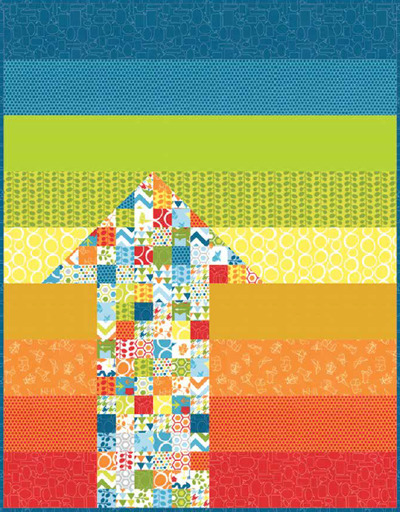 Deb Rowden's dazzling Housetop quilt, above, was made with recycled shirts and purchased plaids and stripes. 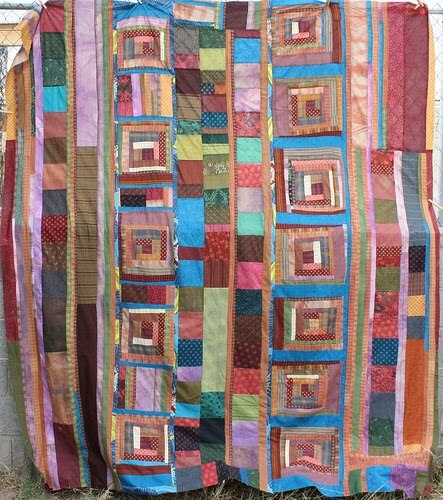 Her site, Deb Rowden's Thrift Shop Quilts, proclaims: "It's not trash, it's found". 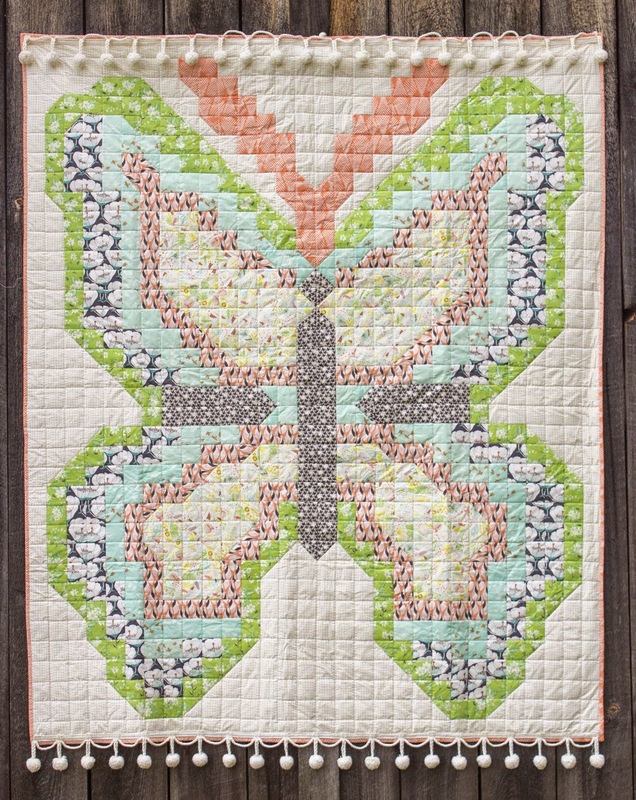 Just yesterday she showed a lovely Springtime quilt made from scraps of pretty florals. 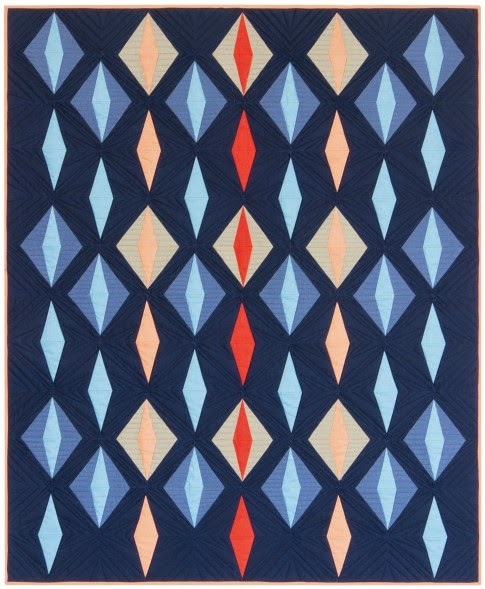 We also covet her blue plaid quilt (and so many others on her site). Deb is not only a quilt artist and thrift-shop-quilt guru, but also a publisher and an author. Her newest book is called Making Memories: Simple Quilts from Cherished Clothing. 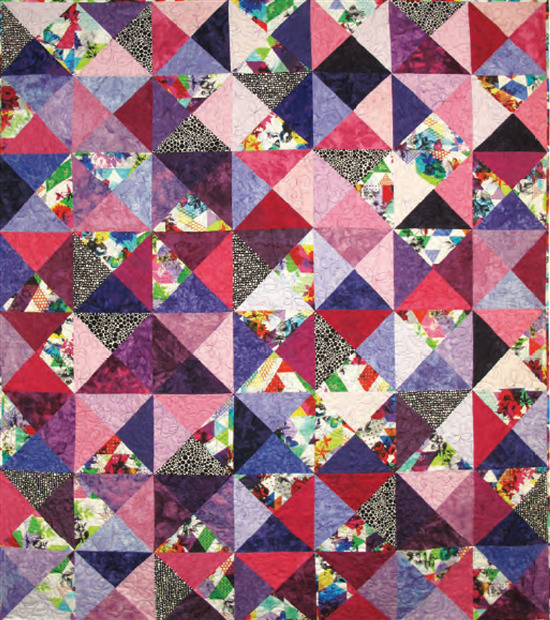 The book shows examples of antique and contemporary memory quilts, and explains how to create one-of-a-kind quilts from clothing (bring your memories out of storage, and back to life!) For more inspiration, read one of Deb's real-life stories about memory quilts. 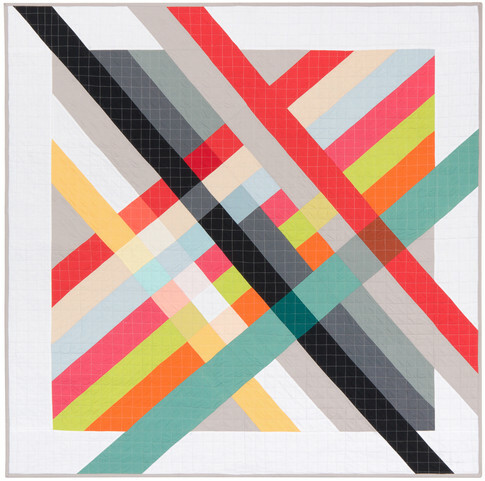 This is one of our all-time favorite attic windows quilts. Just imagine the possibilities for the re-use of cottons and flannels, and madras plaids (remember madras shorts? If you're lucky, you'll find some at the thrift store). The warm and cool color contrasts of the mitered window 'frames', which are done in prints, create a fantastic pattern. 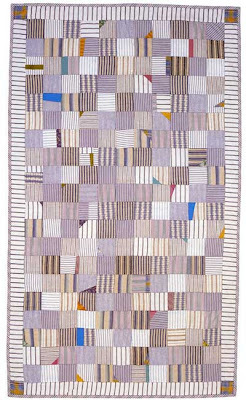 Note the arrangement of contrasting values; the lightest fabrics are used on the tops of the attic windows, so that the light source appears to be coming from the bottom of the quilt. 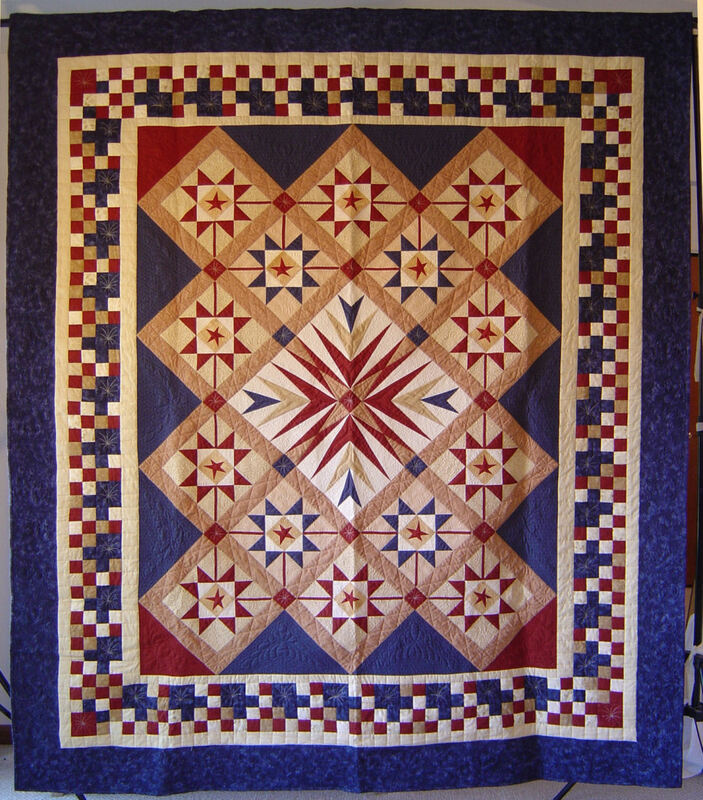 To see this quilt and many others, visit Jean Dyer Goulden's photo gallery. 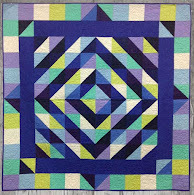 For tips on attic windows quilts, see the tutorials by Susan Druding on equilters.com. 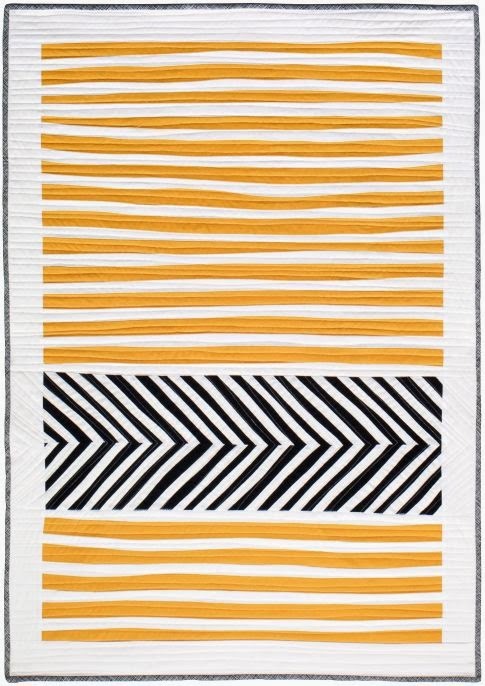 Aardvark Quilts has a fantastic selection of patterns that are perfect for stripes and plaids, including "Antique Rug", above. We love the quilt as shown, with its masculine red, brown and black colorway... wouldn't it also be pretty in red, white and blue shirting fabrics? 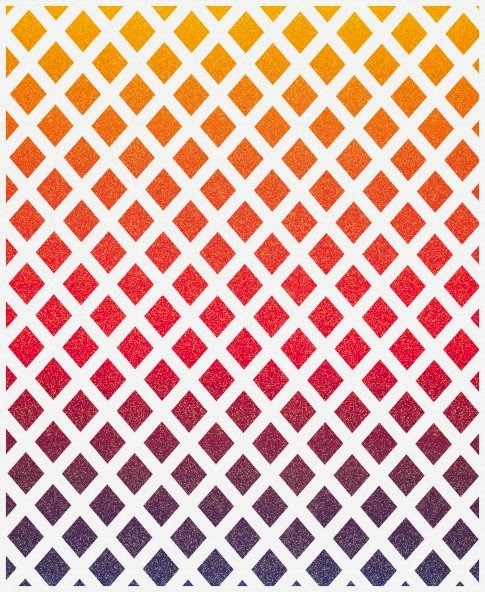 For another great pattern, consider the delightful Squares Squared, which is shown below. Aardvark Quilt patterns are carried in many shops; for one online source, see Gruber's Quilt Shop. 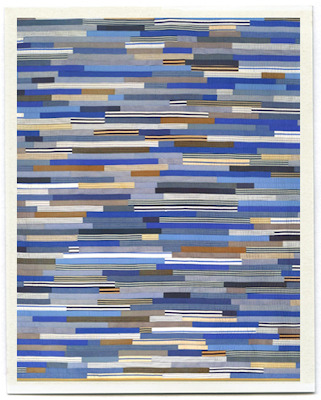 Note added on June 10, 2010: Please don't miss the wonderful Fisher Foresi Quilt by Erin Wilson. It was made with 42 pairs of boxers, several pants and button down shirts, and was made in memory of the young man who wore the clothes. Image credits: Images are displayed with the generous permission of the artists. 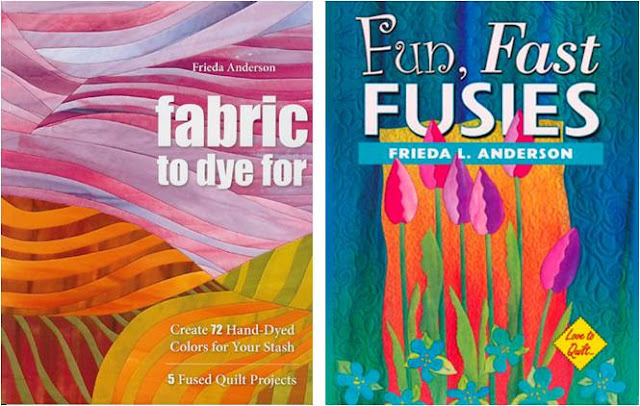 Frieda Anderson is a renowned author, teacher, artist, and quilt designer whose custom-dyed fabrics form the basis for her dazzling quilts, which celebrate the vibrancy of the natural world. 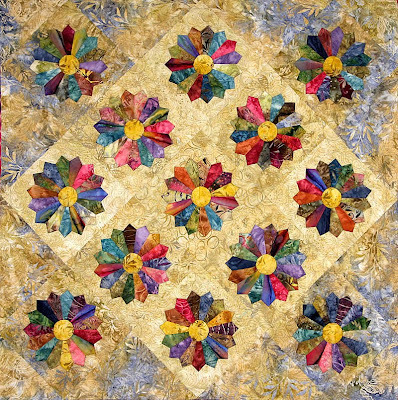 Educated as a professional artist and fashion designer, Frieda decided in 1992 that she wanted to devote her career to her full time fascination with quilts. The results have been a highly successful collection of fabrics, classes, patterns, books... and magnificent quilts! 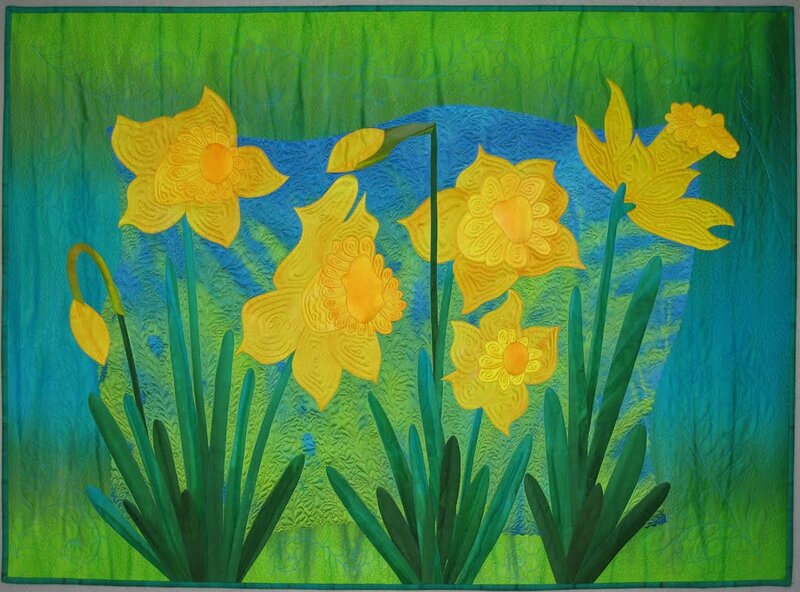 "Spring Greetings" is an award-winning quilt, constructed with Frieda's own hand dyed silks and cottons. The quilt displays one of Frieda's "signatures": her resplendent cerulean blue and aqua fabric, which vibrantly captures the tones of sky and water. The golden yellow daffodils create a stunning contrast. Spring Greetings recently (April 2010) won the second place award for wall quilts at an American Quilters Society show. The subtle highlights in the sky and green grass create a lovely glow, which would really brighten up any wall by bringing the outdoors inside. Green triangles depict the foliage of these graceful pine trees, as their gently curved trunks sway in the breeze. The horizontal quilting lines at the base of the tree trunks provides a perfect balance to the vertical focal points provided by the tree trunks. 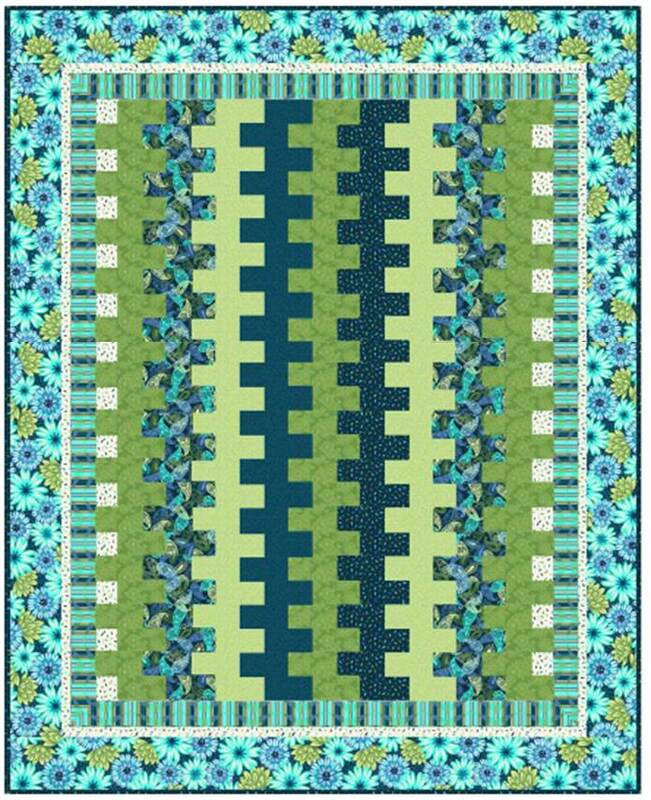 We love this sparkling, contemporary quilt which draws the eye into a serene and enchanted forest. Frieda writes that each day, she takes a walk in the woods with her dog, George. Her quilts almost always reflect her fascination with nature, and what she sees on her walks. 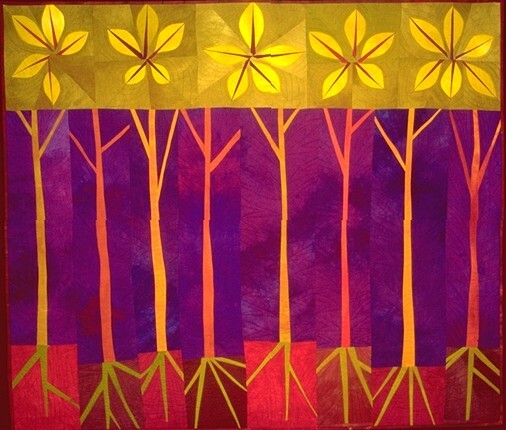 This quilt celebrates the trees in the woods, with golden sunlight shining through the leaves. By depicting tall slender tree trunks and showing a cut away section of the roots, Frieda has emphasized the vertical lines she sees on her walks. 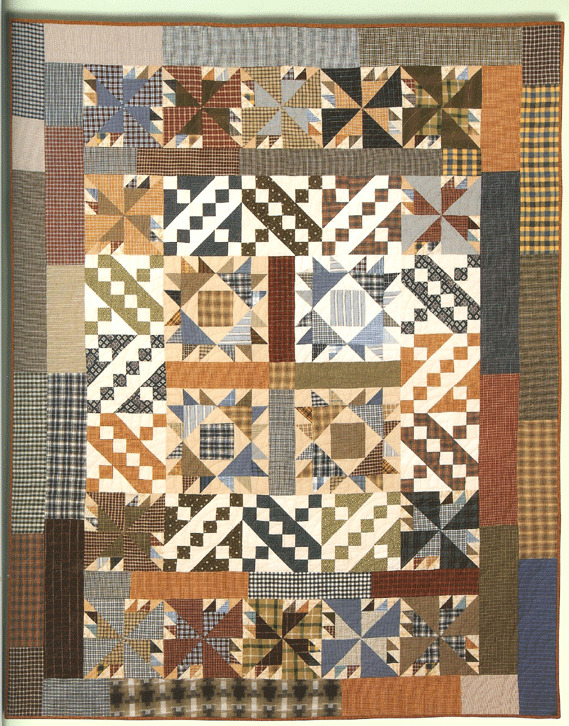 This quilt is in a permanent collection; for more information see Frieda Anderson's Portfolio. "Illinois Landscape" depicts the gently rolling hills of the northern prairies. Frieda shows the gradations of the beautiful purple sky with streaks of lavender and magenta in her vibrant hand-dyed fabric. She carries the use of stripes and streaks through to the green, brown, and orange fields, where the stripes suggest freshly plowed earth, ready for planting. "Woodland Treasures II" is a fabulous example of Frieda's quilting skills. This lovely piece was quilted with rayon and silk thread, on cotton and silk fabric. 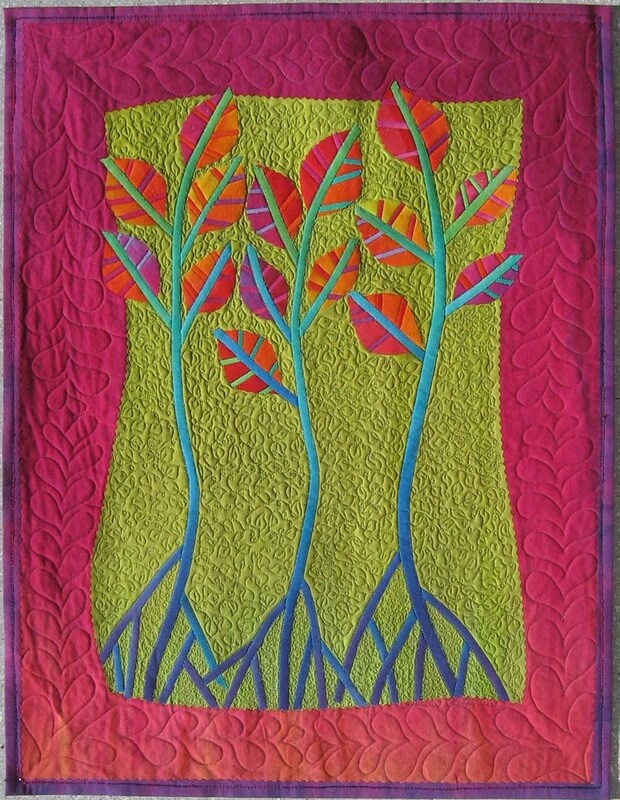 Frieda writes about her quilting techniques on her blog, Walks In the Woods. 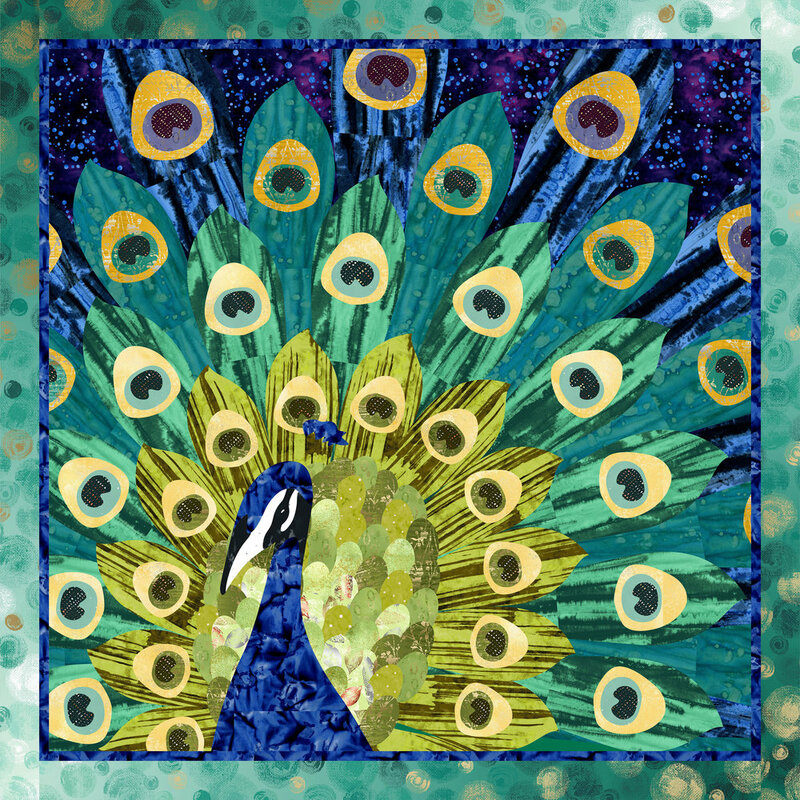 Frieda sells patterns for some of her spectacular quilts on her patterns page. Above, we're showing two of our favorites: "Dancing Trees" and "Autumn Mums". In Dancing Trees, trees with brilliantly colored leaves seem to embrace each other. We also love Autumn Mums... the joyful flowers seem to jump right off the quilt! In addition to the instructions, this pattern comes with its own step-by-step demonstration on DVD, so that you can easily follow the quilt-making process. You can bring the outdoors in by creating these radiant art quilts. Finally, wouldn't it be great to have fabric in just exactly the shade that you need? Frieda's book, Fabric to Dye For, contains complete instructions for creating your own fabulous fabric; and Fun Fast Fusies provides detailed, easy-to-follow instructions on creating these beautiful images by using fusible applique. The books are available at the Friestyle shop. Image credits: Images are shown with the generous permission of Frieda Anderson. For more information visit her Friestyle website. 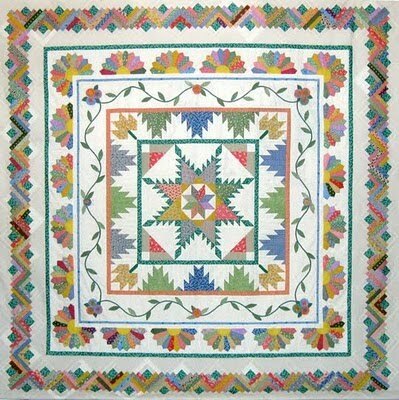 The 26th Annual Sunflower Piecemakers quilt show will be held on June 26 and 27 in Ottawa, KS. 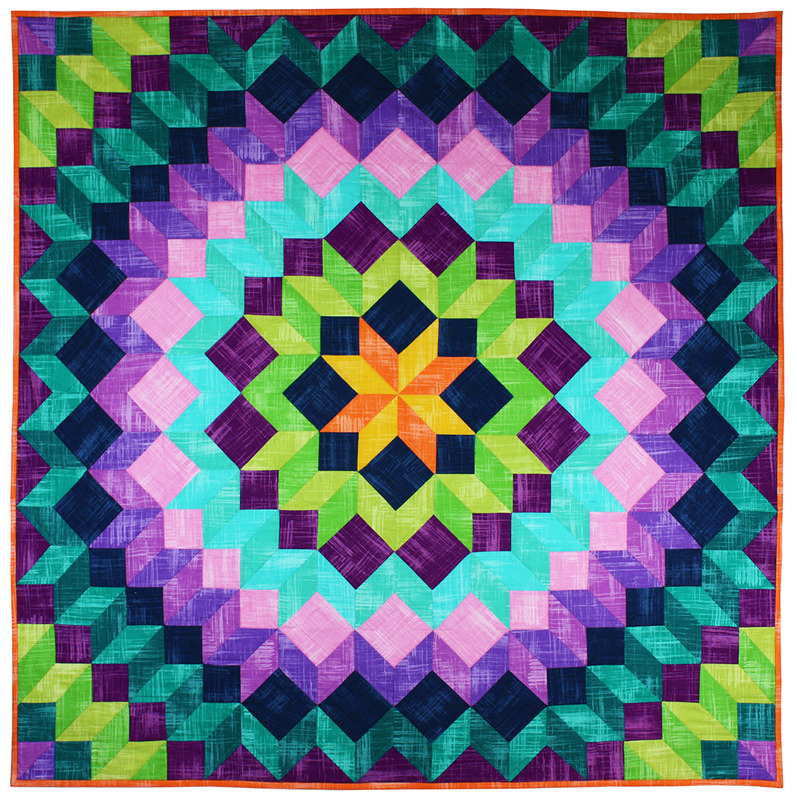 Guild members will display over 200 quilts completed during the past year. The show promises to be a fantastic one. 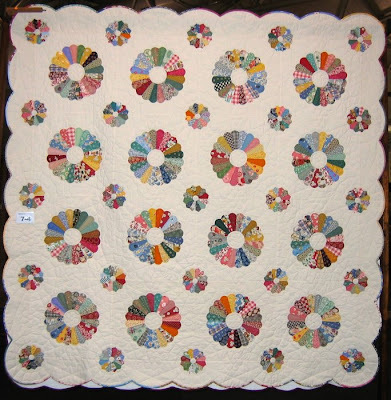 Among other highlights, the 2009 Hoffman Challenge exhibit, consisting of 40 quilts made using Hoffman’s Paisley challenge fabric, will be on display. There will also be a miniature quilt auction on Sunday June 27 at 3:00 p.m.at 1320 Ash, Ottawa, KS. 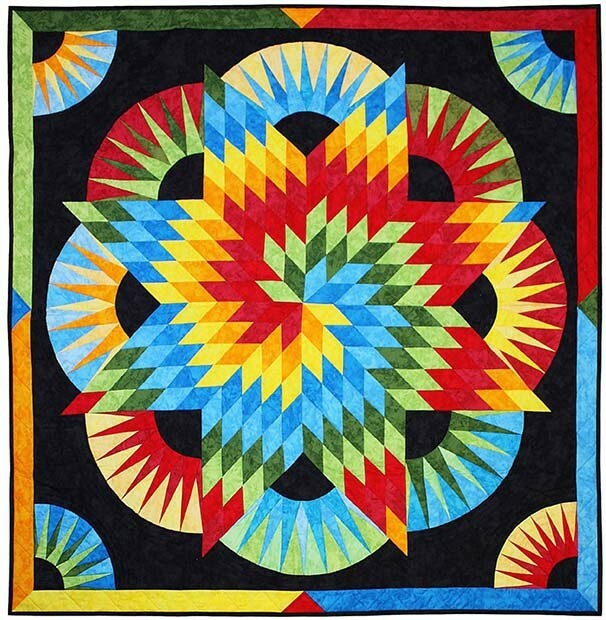 We covet the magnificent Sunflower Piecemakers opportunity quilt, above, which was hand-appliqued and hand quilted by guild members. 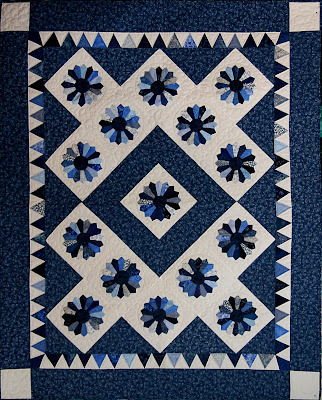 The languid floral applique gives such a peaceful feeling to the quilt. 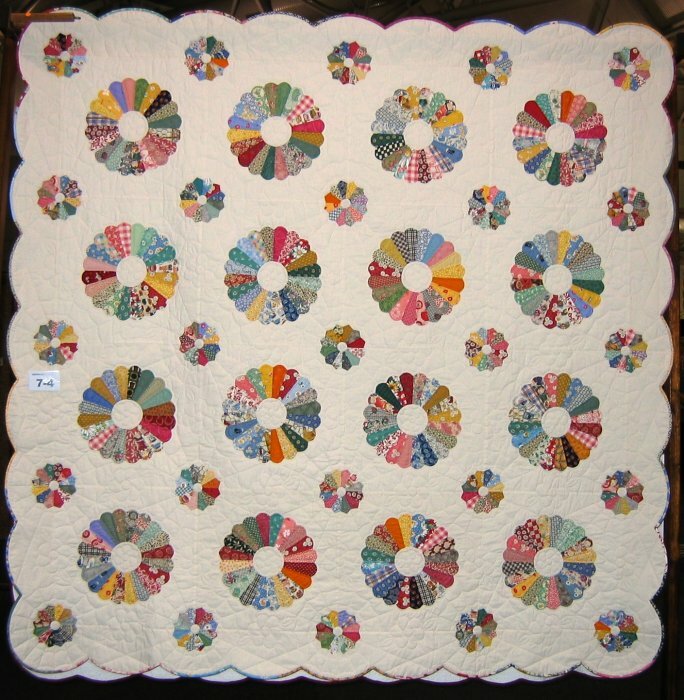 Also we are in awe of the precise hand quilting, which completely surrounds the center medallion and echoes the scalloped edges of the quilt. We can't imagine the thousands of stitches (or hours) that must have gone into this heirloom. At approximately 4:30 pm on Sunday, June 27, the drawing will be held for this beauty. Raffle tickets are $1 each or 6 for $5. You need not be present to win! 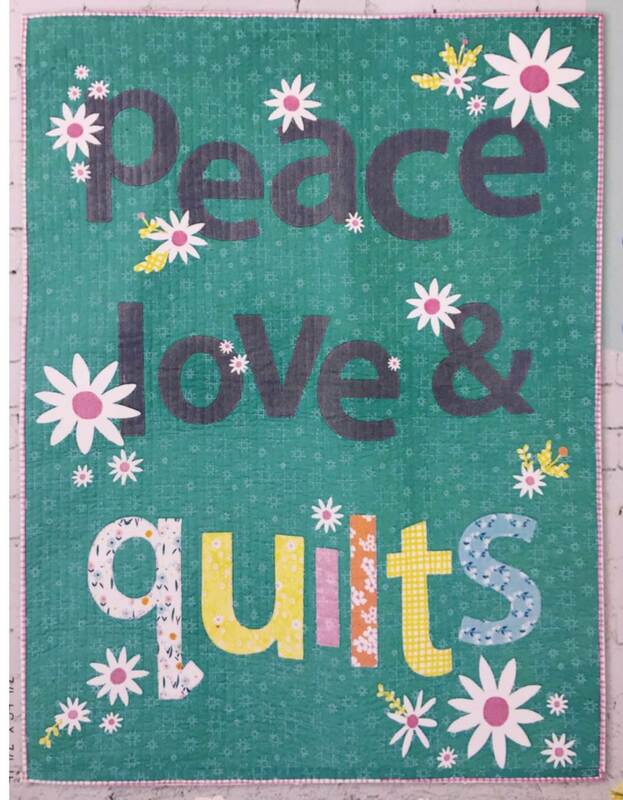 For additional quilt show information contact the show chair, Mary Schleicher at pgsteacher@aol.com or 785-566-8811, or Celia Davis at 785-566-3629. For more information about the Sunflower Piecemakers Guild and show, visit their website. Image credits: The image is shown with the generous permission of the Sunflower Piecemakers Guild. Note added on October 9, 2010: The pattern is a Progress vintage Tree of Life applique design, recently spotted at Nova Scotia Quilts (with detailed photos here). You can also see a museum version of the quilt at The Quilt Index.